We touched down in Melbourne a little behind schedule, but retrieved our bags quickly and were picked up by the car rental company in the Toyota minivan which we would be using during our stay in Victoria. It was a relatively ancient vehicle, with in excess of 300,000 km on the odometer, lacking even power windows in the rear. When is the last time you manually cranked down your windows? When is the last time you rented a vehicle of that vintage? In any event it sufficed for our journey. It was a long drive to the Melbourne suburb of Lilydale, through some quite rural areas. We saw Eastern Cattle Egrets (Bubulcus coromandus) in breeding plumage attendant upon herds of plodding bovines and at one point a Wedge-tailed Eagle (Aquila audax) mantling prey. 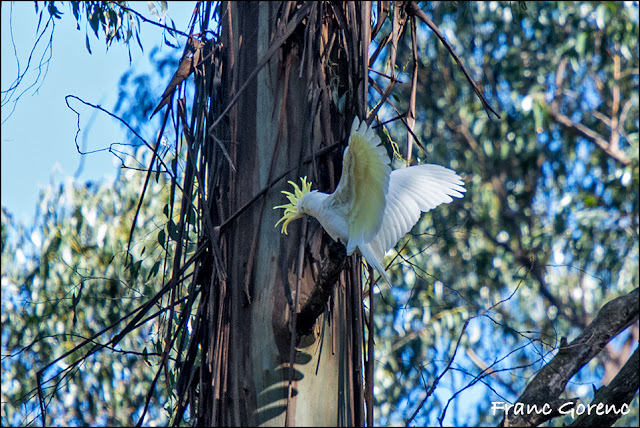 Our house, Treetops, in Lilydale, was set amid mature eucalypts, a sterling location for birders, but the house itself could use a little work! The owner was there to meet us, and had filled a bird feeder with seed, and strewn it along the deck rail too, so we were also greeted by Eastern (Platycercus eximius) and Crimson Rosellas (Platycercus elegans). 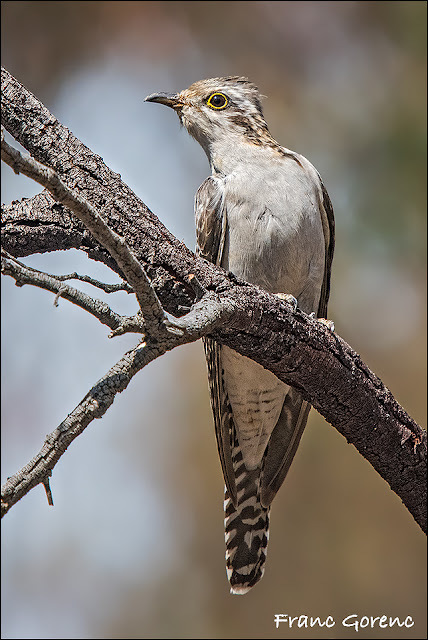 The loud noise of Laughing Kookaburras (Dacelo novaeguineae) rattled through the trees and I could not figure out whether they were welcoming us or telling us to get the hell out of there! We were advised that the internet was out after a major storm earlier in the week but that an attempt was being made to have it restored. A little background information is in order here. Before leaving Canada I had been communicating with Stewart Monckton, a fellow blogger who had kindly agreed to help us bird in Victoria. Stewart had invited us to his home to plan our activity for the next few days, so we called him to let him know we were on the way to Mont Albert where he lives. A warm welcome awaited us and the wine flowed freely. Stewart ordered a couple of giant pizzas and along with his children Hamish and Pippa we enjoyed fabulous food and even more fabulous friendship. I am bound to confess that my love affair with the Monckton family had already begun. Stewart has a library to rival my own, a little better even, and in glancing at certain volumes on his shelves I had twinges of book envy! The rich brogue of this transplanted son of Somerset engaged us all, and his sharp wit was entertaining indeed. His wife, Sally, was at a choir practice, and we would have to wait until the next day to be charmed by her too. While in NSW Franc had lost a lens cap and despite a thorough search of Andrew's car it could not be found. In the interim Andrew had advised Carol that he had subsequently found it in the dark recesses of his trunk and had arranged to have it mailed to Melbourne in care of Stewart. How delighted I was when Andrew also sent along a copy of his excellent book Birds of Sydney for me. Thank you Andrew. We finally left Stewart to return to Lilydale, with the arrangement that we would meet again at his house the following morning. Before getting into the van Stewart was able to show us a couple of Common Ringtail Posssums (Pseudocheirus peregrinus) in the tree along the sidewalk outside his house. I looked forward to the pleasure of the morrow! All species 08 October: Maned Duck, Eastern Cattle Egret, Wedge-tailed Eagle, Masked Lapwing, Silver Gull, Laughing Kookaburra, Long-billed Corella, Sulphur-crested Cockatoo, Crimson Rosella, Eastern Rosella, Superb Fairywren, Noisy Miner, Australian Magpie, Australian Raven, Common Myna, Common Starling, House Sparrow. Crimson and Eastern Rosellas were busy at the feeder and on the ground outside the house, Laughing Kookaburras cruised to and fro, and honeyeaters were gathering nectar at flowering plants of every description. 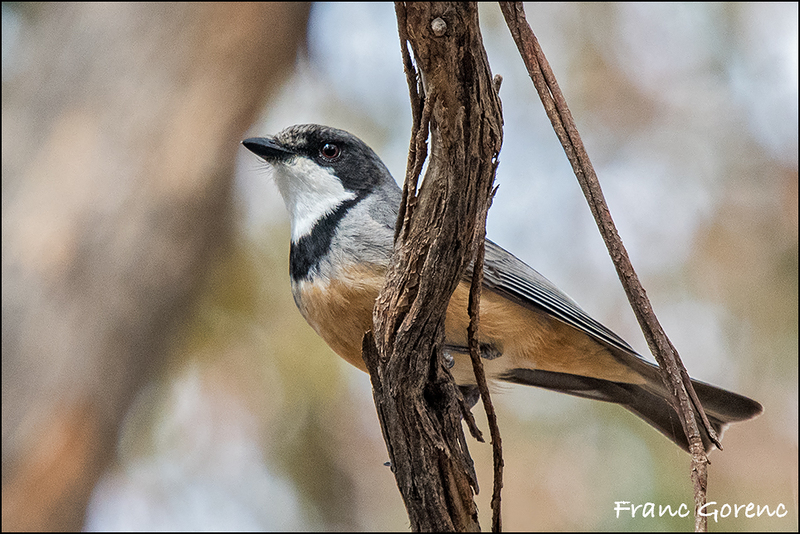 How can you fail to be moved by Eastern Spinebill (Acanthorhynchus tenuirostris) each time you see it? 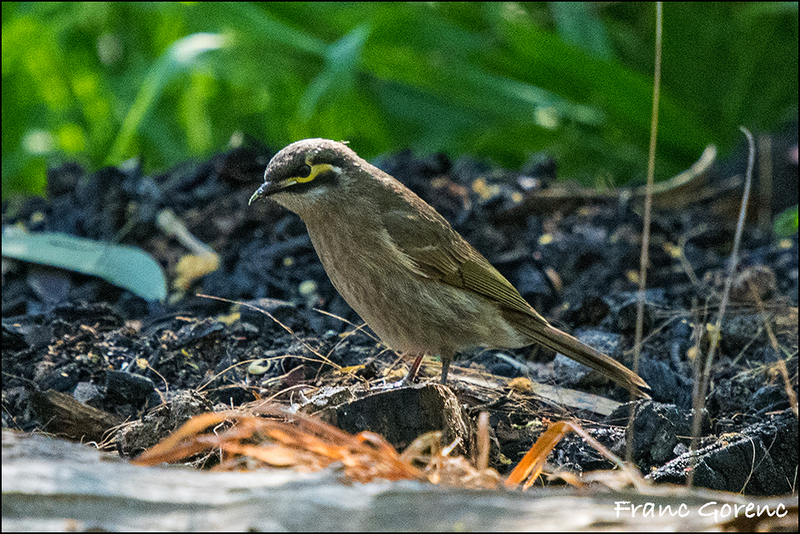 A Yellow-faced Honeyeater (Caligavis chrysops) was equally appealing. We left to go to Stewart's house where we all had a coffee before getting into his car to visit Yarra Bend Park, an extensive area of natural woodland right in the heart of Melbourne. Before leaving he gave me a book of which he had an extra copy and thus I was introduced to The Running Sky by Tim Dee, a nature writer of great style and skill. 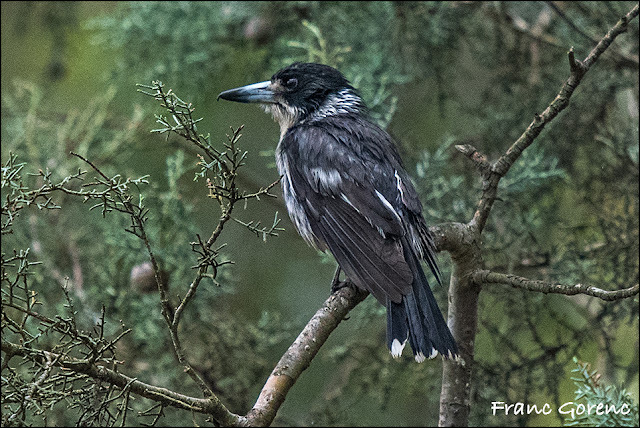 It was raining, at times quite heavily, but that did not deter us and we meandered along various trails, guided of course by Stewart who knew based on long experience the best trails to find various species. The birding was terrific and we avoided getting too soaked. The one thing I had forgotten to pack was a raincoat so Stewart lent me a waterproof jacket when we got back to his house to use for the rest of our stay in Melbourne. 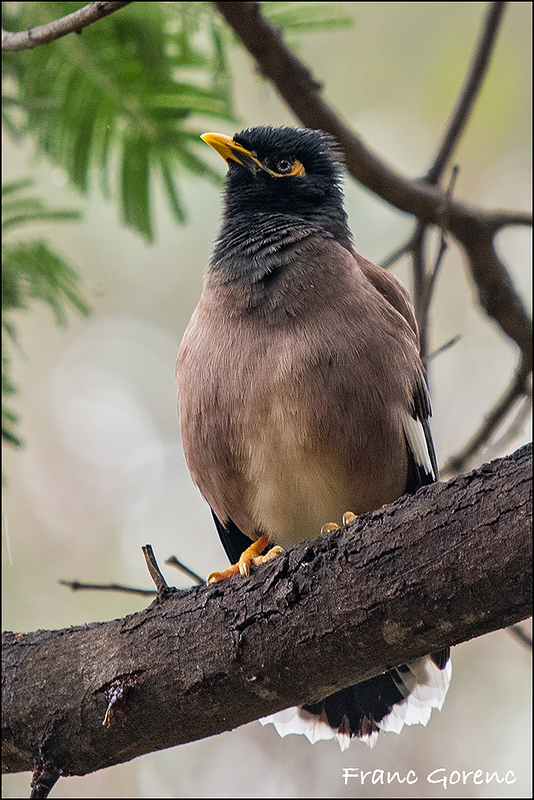 As was true every day we saw Common Myna (Acridotheres tristis), not the favourite bird of the Australian birding fraternity (or sisterhood perhaps), but undeniably attractive. 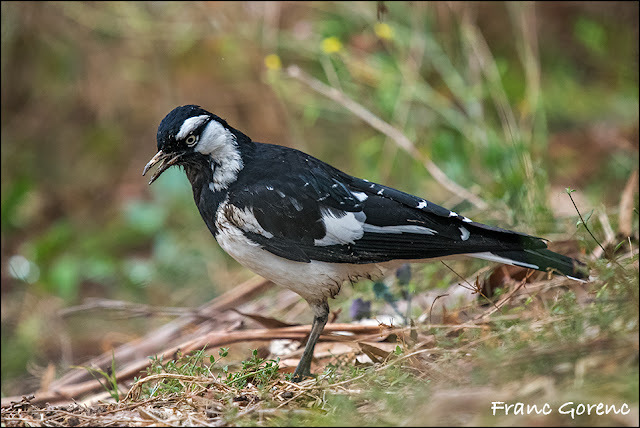 Magpie-lark (Grallina cyanoleuca) was ubiquitous also. Grey Butcherbird (Craticus torquatus) was a bird we saw more frequently than I thought we might. One of the sheer pleasures of a visit to Australia is the daily encounter with psittacids of one kind or another, and it is hard to rank them in terms of appeal, but Red-rumped Parrot (Psephotus haematonotus) is surely the most refined in colouration, with delicate hues and shades blending and complimenting each other. 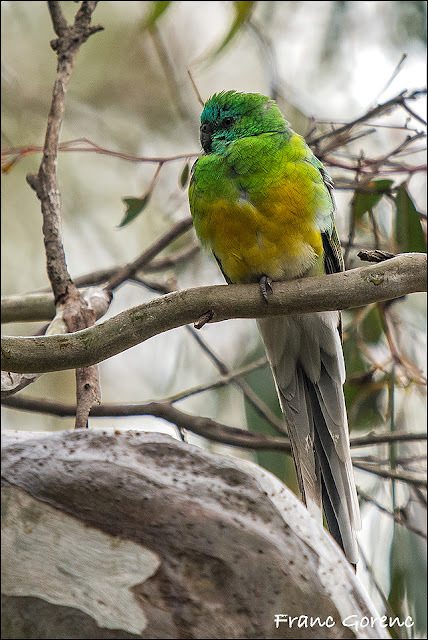 I remember, at one point on the trails, I was trying to spit out the English name for Trichoglossus chlorolepidotus and wanted to say Streak-breasted Lorikeet instead of Scaly-breasted Lorikeet, and momentarily Stewart was grasping too. His reaction was, "Two people sundered by the same language!" How can you not appreciate a fellow with expressions like that? Furthermore, I noticed that at no time did anyone in the entire family ever use either of those inane and annoying terms "cool" or "neat." It really gets to be tiresome hearing otherwise intelligent people fall back on this gibberish, this infantile jargon, this argot of the incapable, so frequently expressed as though no other adjective exists. The English language is rich with expression. Is cool and neat the very best they can do? There was a café in the park with a range of offerings on the menu so we ate lunch there sitting outside under wide umbrellas adequately protected from the rain. Miriam chose a chili chicken wrap which she said was excellent; I had fish and chips which was very good indeed and Stewart told me that the fish frequently used is shark. Stewart introduced us to skinny lattes. Miriam and I first split a cappuccino and then I tried the aforementioned skinny latte and enjoyed them both. Skinny by the way simply indicates that it is made with low fat milk. After lunch we visited the garden at the home of a friend of Pippa's where Stewart had been made aware of the presence of two Tawny Frogmouths (Podargus strigoides). The rain by now was beating down, but we saw the two birds very clearly, and were delighted to experience this difficult species again. It is not that the bird is so rare, it is just so incredibly difficult to see, looking for all the world like a dead branch on a tree. Camouflage has reached its pinnacle with species like this. The two birds here were relatively visible, actually. We returned to Stewart's house to have a cup of tea in the back yard and were very happy to find Sally at home. It was pleasant indeed to sit out in the warm sunshine, the rain having finally stopped, under the watchful gaze of the cats, and to chat to Sally about her choir and its repertoire. My three passions in life reached a confluence at this house - birds, music and books. I would happily have spent the rest of the afternoon chatting with Sally! Among other things I learned that her choir, Chime, had recently performed at Carnegie Hall in New York. I have made a point to subsequently watch it on You Tube (and you should too), and a fine, fine choir it is. After leaving Stewart's house we visited a shopping area filled with produce stores, delicatessens and other specialty shops and bought items we needed, both for dinner that night and for provisions for the week. We had made prior arrangements to meet Stewart on Philip Island the next day, a prospect we all looked forward to as we settled in for the night. All species 09 October: Maned Duck, Pacific Black Duck, Australian White Ibis, Little Pied Cormorant, Great Cormorant, Dusky Moorhen, Eurasian Coot, Masked Lapwing, Silver Gull, Rock Dove, Tawny Frogmouth, Laughing Kookaburra, Sulphur-crested Cockatoo, Australian King Parrot, Red-rumped Parrot, Crimson Rosella, Eastern Rosella, Rainbow Lorikeet, Superb Fairywren, Eastern Spinebill, New Holland Honeyeater, Little Wattlebird, Yellow-faced Honeyeater, Noisy Miner, Australian Magpie, Grey Butcherbird, Pied Currawong, Willie Wagtail, Grey Fantail, Magpie-lark, Australian Raven Welcome Swallow, Common Myna, Common Starling, Common Blackbird, House Sparrow. I had heard the wind roaring during the night, and the sound of limbs creaking, and it was still quite strong when we woke up. There were small branches on the ground and leaves all around. We left for Philip Island at 07:45, still unresolved as to whether we would stay for the Penguin Parade. I dearly wanted Miriam to have a chance to see Little Penguin (Eudyptula minor), but I was a bit concerned about the whole Disneyland aspect of the event. Our drive to the island was very pleasant, with tranquil country and modest traffic. We arrived at our prearranged meeting point and Stewart was already there waiting for us, with a Fan-tailed Cuckoo (Cocomantis flabelliformis) bursting with song from a tree in the parking lot. A coffee seemed in order, following which we followed Stewart to a series of coastal ponds with berms or embankments where he knew based on long familarity with the area, that we would find Cape Barren Goose (Cereopsis novaehollandiae), that primitive Australian goose that has at times defied classification, sometimes being placed in its own tribe. It is morphologically unique, quite unlike any other waterfowl encountered in Australia. How fortunate we were to have several individuals at close range, some with stripey goslings in their care. Strangely, despite this goose's affinity for the coast, it rarely swims, only entering the water to avoid danger. I was very happy to have the opportunity to see it for as long as I wished. 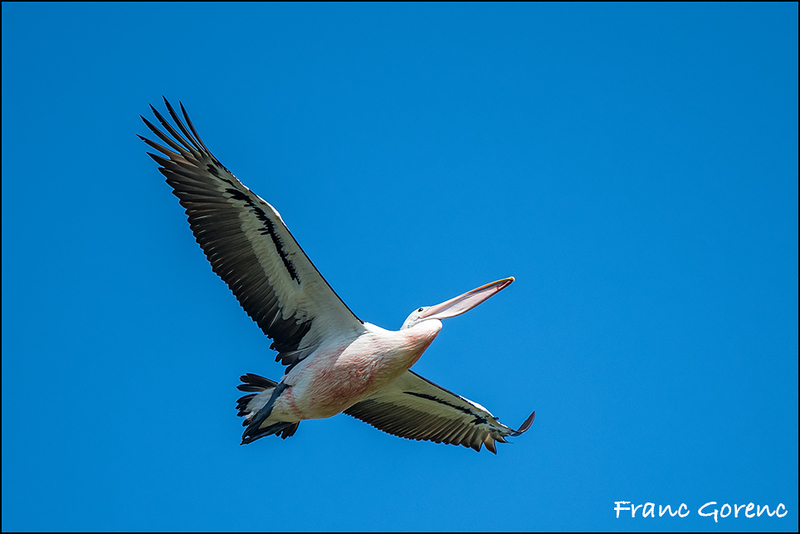 An Australian Pelican (Pelecanus conspicillatus) flew overhead, revealing a pinkish hue to its belly, a condition I assume is related to a diet rich in carotenoids. It was very helpful to have Stewart as our guide and he took us to various places he knew to be productive and delivered a fine range of species for us. I was happy to ride in his car, both to give him a little companionship, but to enjoy his wit, and benefit from his breadth of knowledge about things avifaunal, and much else. We visited the Ventnor Koala Reserve, where Koalas (Phascolarctos cinereus) are being cared for in captivity, but in as natural a setting as possible, with serious scientific intent, while simultaneously rendering public education. 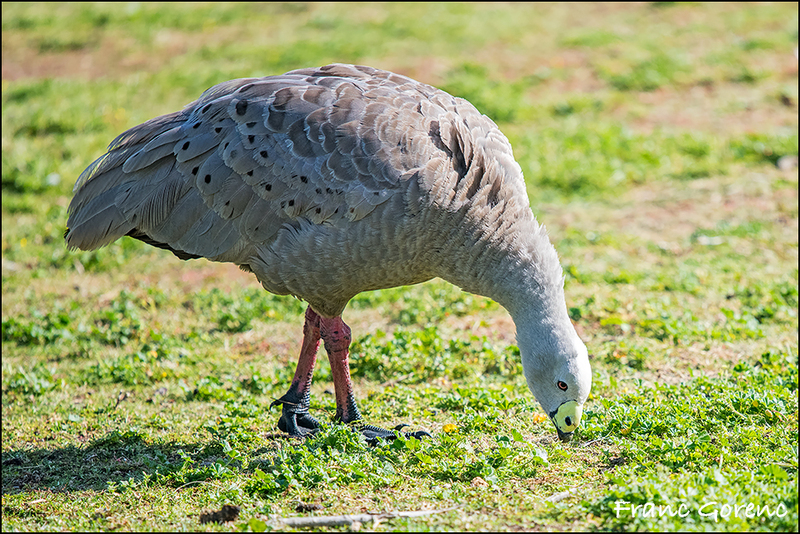 The funds from entry fees contribute in large measure to the protection of the species and captive breeding provides the possibility of release into the wild. 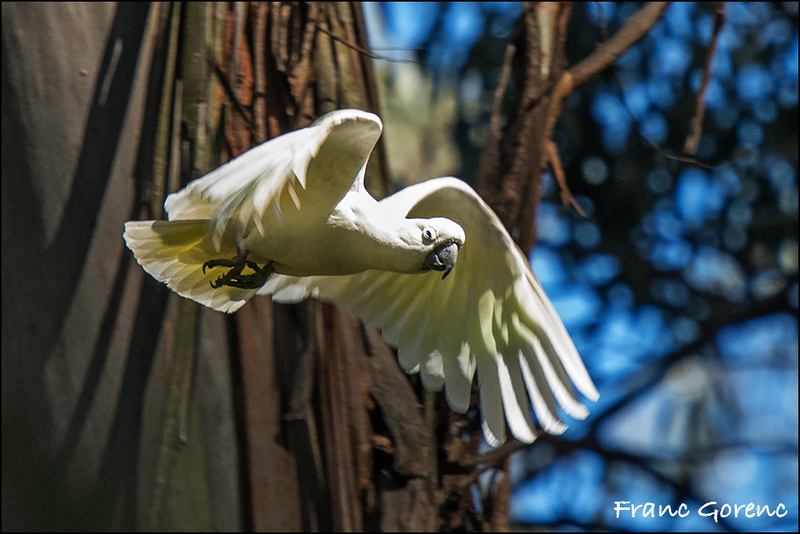 Not only was it a first rate opportunity for us to have a Koala experience, the variety of birds to be found was outstanding, with exceptional photographic opportunities. 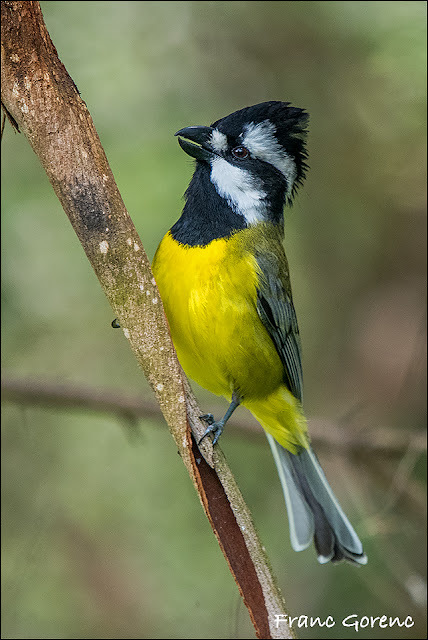 We had crippling looks at a Crested Shriketit (Falcunculus frontatus) and Stewart told us that two of the best views he has ever had of this species were at the Koala Reserve. 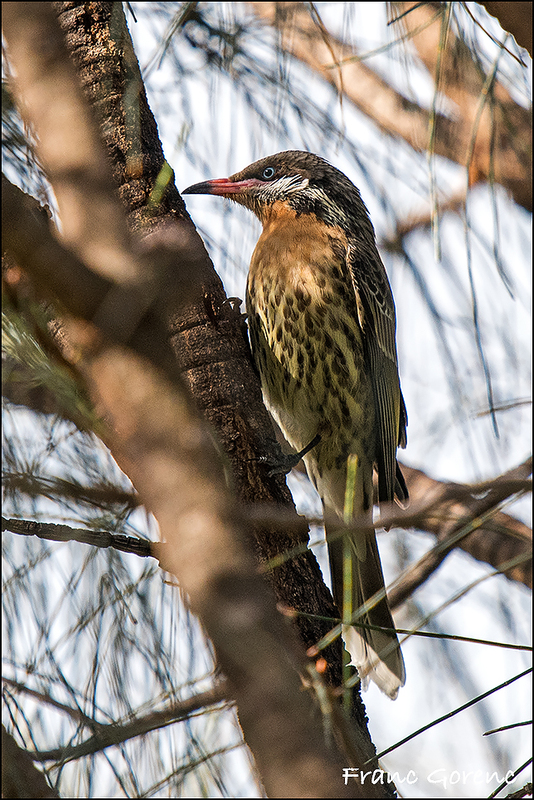 It was also very agreeable to encounter our first Spiny-cheeked Honeyeater (Acanthagenys rufogularis). While there I started to chat with a young girl and her mother. I learned that her name was Emma and that she was quite infatuated with Canada (smart girl!). I gave her some pins and said that perhaps we might see her in Ontario one day. Coincidentally another young mother with a child to whom I gave a pin told me that her sister was married to a Canadian and lives in St. Sauveur, QC. Anything more and I might have burst into the national anthem! 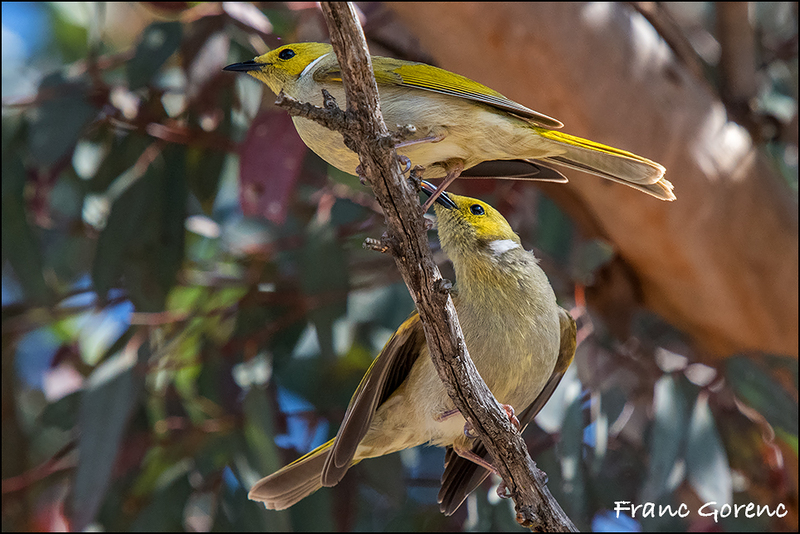 I glanced up at a Koala scampering along a branch and was greeted by the sight of a White-naped Honeyeater (Melithreptus lunatus). 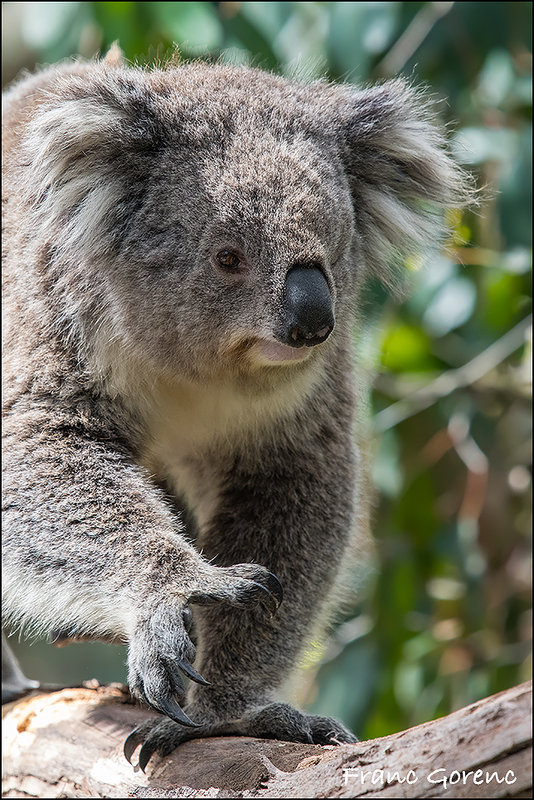 Without exception, we felt that the visit to the Koala Reserve had been very worthwhile and were glad that Stewart had recommended it. Lunch was taken at a picnic table outside the main entrance and based on the warm afterglow of our Koala encounter, a sandwich seemed like a feast. 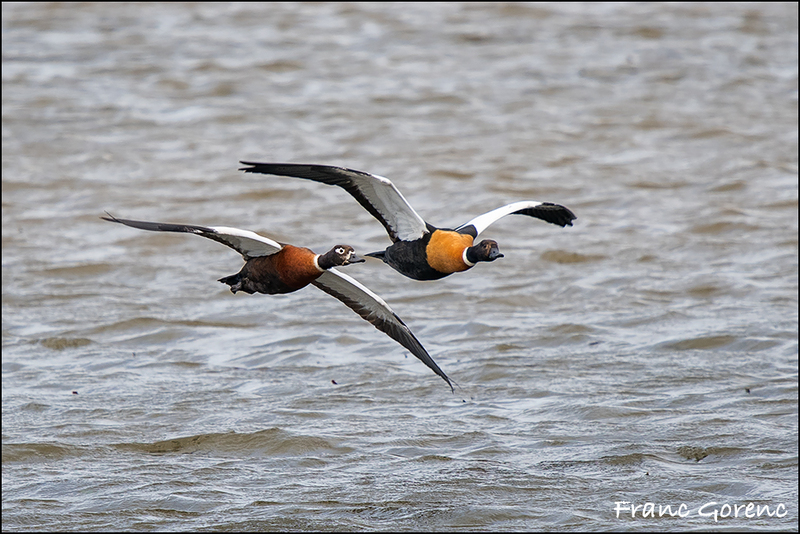 Moving on to Swan Island we espied the first (and in fact the only) Australian Shelducks (Tadorna tadornoides) of our trip. As is true of all shelducks, this is a striking species. 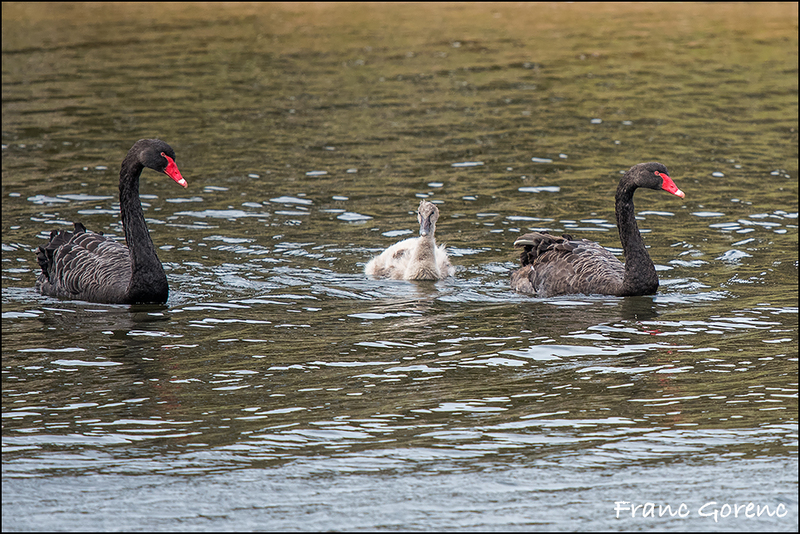 As was to be expected Black Swan (Cygnus atratus) was common on waterways large and small. 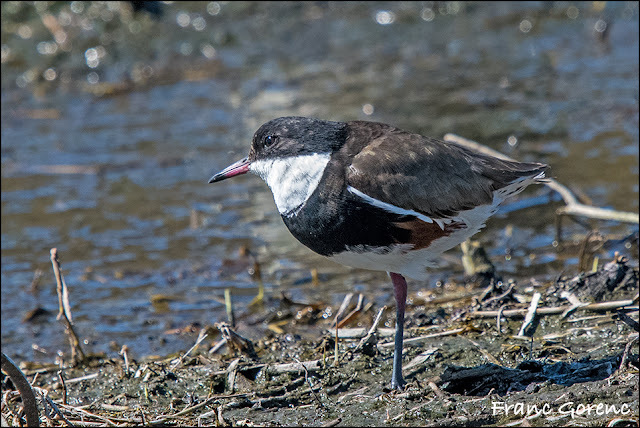 I must say that it was very agreeable to see this species in its native habitat, as opposed to an escape from a waterfowl collection in other places around the world. 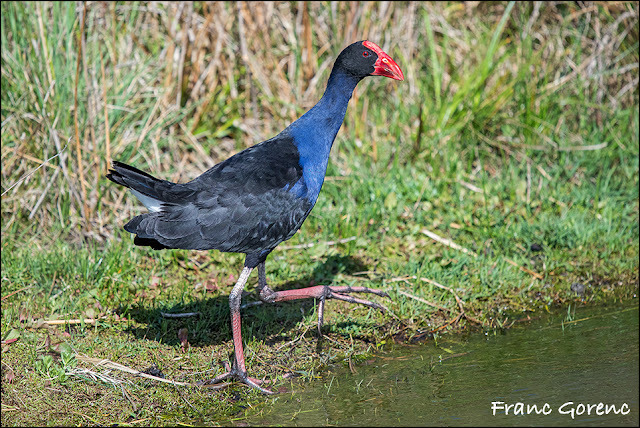 Australian Swamphen (Porphyrio melanotus) strutted around like the Lord of the Manor, with total indifference to lesser mortals! 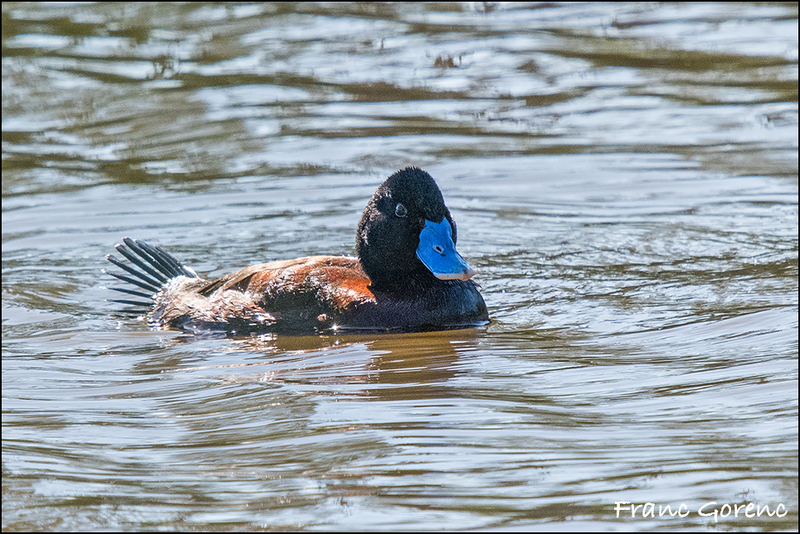 We also were able to enjoy a second encounter with that most bizarre of ducks, the Musk Duck (Biziura lobata), both male and female. Words fail to describe one's first reaction to this strange creature. Swan Island delivered the best variety of waterfowl we came across on our journey through three states. 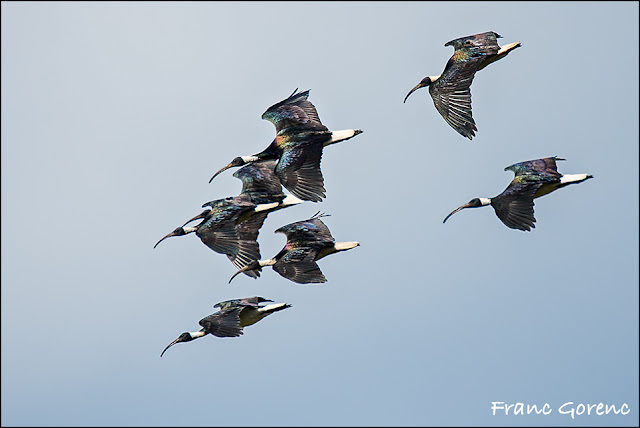 Several Straw-necked Ibises (Threskiornis spinicollis) rounded out the visit to this location, glistening in the sun as they came in for a landing. 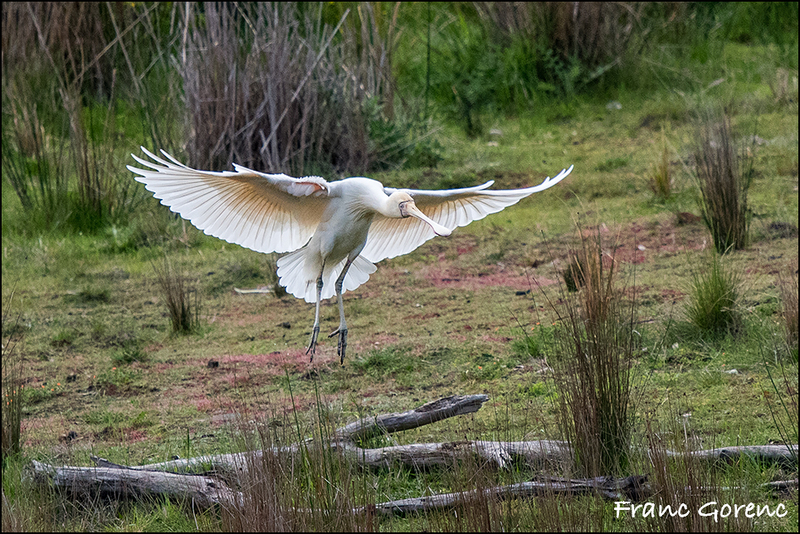 Australia has two species of spoonbill, and we had come across Royal Spoonbill (Platalea regia) so we were delighted to also encounter Yellow-billed Spoonbill (Platalea flavipes). 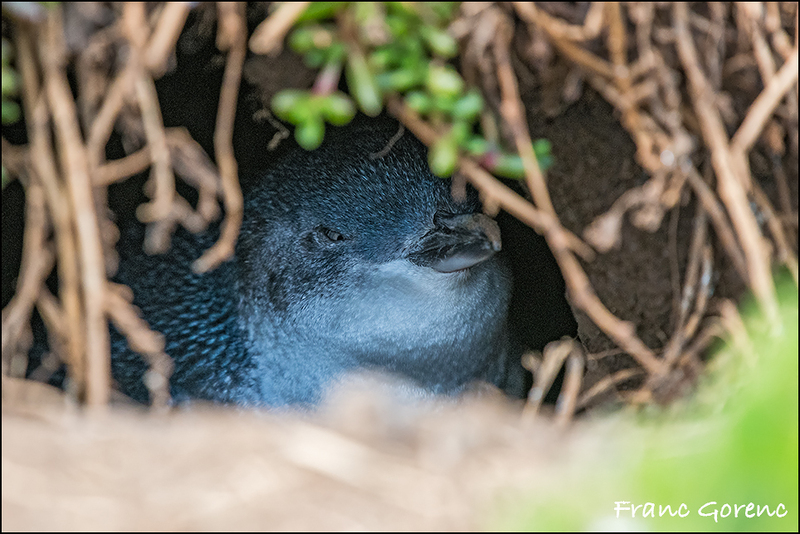 After we left Swan Island we started to see the nesting burrows of Short-tailed Shearwater (Ardenna tenuirostris), a major breeder on Philip Island. They come ashore in their hundreds of thousands at night to find their burrows under cover of darkness, relatively free from predation. I have never experienced this phenomenon and I vow that if I have the good fortune to return one day I will make it a point to do so. 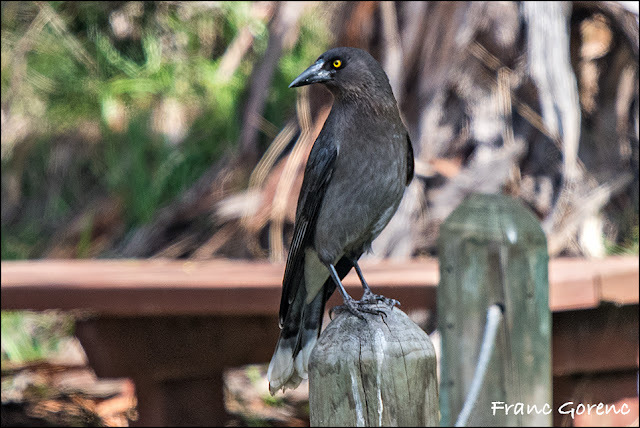 Grey Currawongs (Strepera versicolor) were frequently seen, sometimes perched on posts along the road. 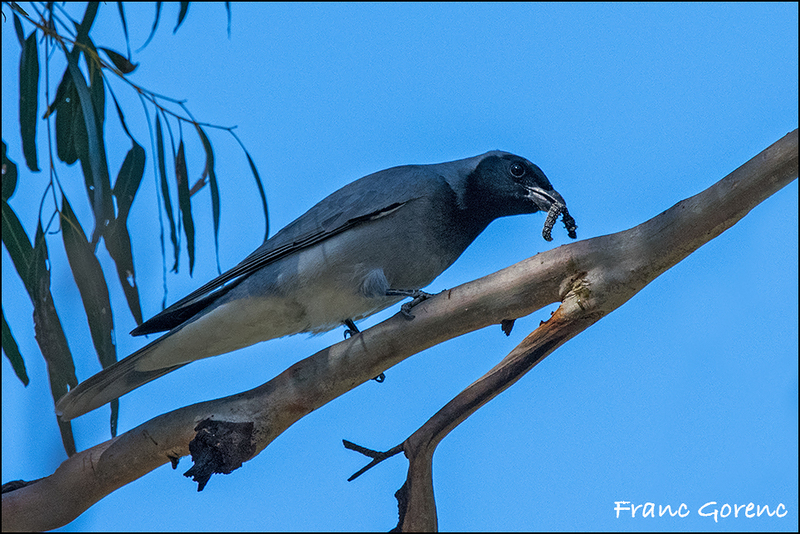 A Black-faced Cuckooshrike (Coracina novaehollandiae) had captured a tasty morsel. Our final stop was at The Nobbies, a high vantage point along the southern coast, overlooking Bass Strait. The wind was incredibly strong, at times threatening literally to blow one off one's feet. But it was was the wind that brought in two of the star attractions of the day. Out on the ocean, riding the updrafts at the crest of the waves, were two species of albatross, Black-browed Albatross (Thalassarche melanophris) and Shy Albatross (Thalassarche cauta). Their effortless gliding across the turbulent sea belied the fierce conditions that would have been challenging for small craft. A couple of Australian Gannets (Morus serrator) joined the albatrosses to thumb their figurative noses at us, land-locked and helpless. Stewart thought he caught sight of a shearwater but we were unable to relocate it. All around us were countless thousands of burrows for nesting penguins and shearwaters. Closely we peered into these havens and finally were rewarded with a couple containing Little Penguins, presumably already incubating their two white eggs. This solved the question of whether we would join the hordes of tourists at the Penguin Parade; there was no longer any need to do so, we had our bird, and in its burrow too. We also had fairly distant views of a Short-beaked Echidna (Tachyglossus aculeatus) while fighting the wind at The Nobbies. It was with a heartfelt sense of gratitude that we said goodbye to Stewart. He had made the two hour trip from Melbourne purely on our account and had proven to be a superior guide and engaging companion. And best of all, he would be with us again tomorrow. Our drive to Lilydale was uneventful and we had memories of a remarkable day to hasten our homeward journey. We had a pasta dinner and retired for the night around 21h:30. I read for a while before falling asleep. All species 10 October: Cape Barren Goose, Black Swan, Australian Shelduck, Maned Duck, Pacific Black Duck, Chestnut Teal, Hardhead, Musk Duck, Little Penguin, Black-browed Albatross, Shy Albatross, Australian White Ibis, Straw-necked Ibis, Yellow-billed Spoonbill, Great Egret, White-faced Heron, Australian Pelican, Australian Gannet, Little Pied Cormorant, Little Black Cormorant, Great Cormorant, Swamp Harrier, Australasian Swamphen, Eurasian Coot, Pied Oystercatcher, White-headed Stilt, Masked Lapwing, Black-fronted Dotterel, Silver Gull, Pacific Gull, Kelp Gull, Greater Crested Tern, Fan-tailed Cuckoo, Laughing Kookaburra, Nankeen Kestrel, Galah, Sulphur-crested Cockatoo, Crimson Rosella, Eastern Rosella, Superb Fairywren, New Holland Honeyeater, White-naped Honeyeater, Spiny-cheeked Honeyeater, Little Wattlebird, Red Wattlebird, White-plumed Honeyeater, Brown Thornbill, Australian Magpie, Grey Butcherbird, Grey Currawong, Black-faced Cuckooshrike, Wille Wagtail, Grey Fantail, Magpie-lark, Australian Raven, Eastern Yellow Robin, Welcome Swallow, Silvereye, Common Myna, European Goldfinch. At first light I stepped onto the deck and was greeted by two Crimson Rosellas gobbling up seed from the feeder and nibbling on the suet ball suspended from a branch. Superb Fairywrens (Malurus cyaneus) scampered along the ground. If one needed a reminder that one was in Australia this was it! Stewart suggested that we return to his house to eat lunch there, which we were quite happy to do. We were joined by Sally and passed a very agreeable time chatting, and getting to know her. 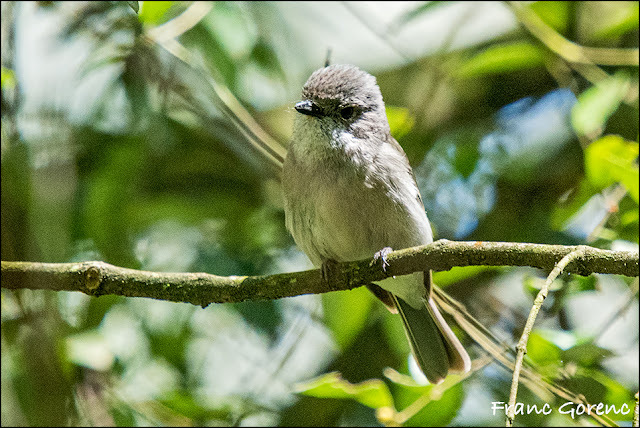 In the afternoon we visited Jell's Park where the birding was in total contrast to the morning and we enjoyed a wide variety of species. 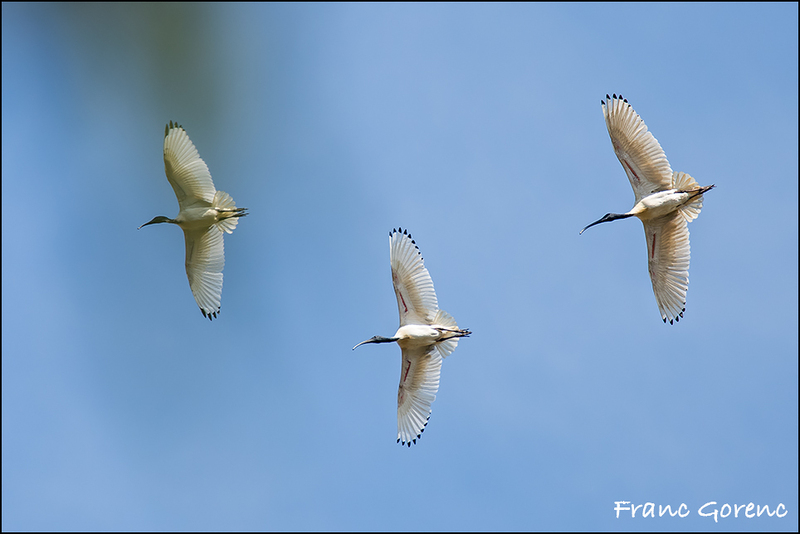 Chief among the interesting aspects of this location was a substantial breeding colony of Australian White Ibis (Threshkiornis molucca) with individuals in every stage of development. Little Pied Cormorants (Microcarbo melanoleucos) seemed also to be nesting among the ibises, and several Australasian Darters (Anhinga novaehollandiae) were swimming, fishing, tossing captured fish in the air to gulp down in an instant, and were perched like a vision from the dawn of time, drying their wings. There was an agreeable and diverse range of waterfowl. Stewart knew that I was looking for Blue-billed Duck (Oxyura australis) and quickly found it and told me to stand in front of him and get a tick! The experience was enhanced by glancing to the rear and finding Freckled Duck (Stictonetta naevosa) as well. Pink-eared Duck (Malacorhynchus membranaceus) added another exciting dimension to our waterfowl bonanza. To a North American eye it is exciting and exotic. We left Jell's Park very satisfied with our visit. Stewart left to go home and we did too, picking up pizza for dinner along the way. It was enjoyed back at Treetops with a glass of Shriraz. The internet connection had been restored so we had WIFI too, a cause for celebration for all of us. As I brought my notes up to date I reflected on another magical day of discovery in Victoria, aided in such great measure by that selfless champion, Stewart Monckton. The star of good fortune had indeed shone down on us. All species 11 October: Freckled Duck, Pink-eared Duck, Maned Duck, Pacific Black Duck, Grey Teal, Chestnut Teal, Hardhead, Blue-billed Duck, Hoary-headed Grebe, Australasian White Ibis, Eastern Cattle Egret (Franc only), White-faced Heron, Australian Pelican, Little Pied Cormorant, Little Black Cormorant, Great Cormorant, Australasian Darter, Australasian Swamphen, Dusky Moorhen, Eurasian Coot, Masked Lapwing, Silver Gull, Rock Dove, Spotted Dove, Crested Pigeon, Galah, Little Corella, Sulphur-crested Cockatoo, Crimson Rosella, Superb Fairywren, Little Wattlebird, Red Wattlebird, Noisy Miner, White-plumed Honeyeater, Brown Thornbill, Australian Magpie, Pied Currawong, Black-faced Cuckooshrike, Willie Wagtail, Grey Fantail, Magpie-lark, Australian Raven, Common Myna, Common Blackbird. Moving day! We were simply moving from the west side of Melbourne to the east side to be closer to some of the reserves we wished to visit. I had an excellent night's sleep and did not get out of bed until 06h:45. 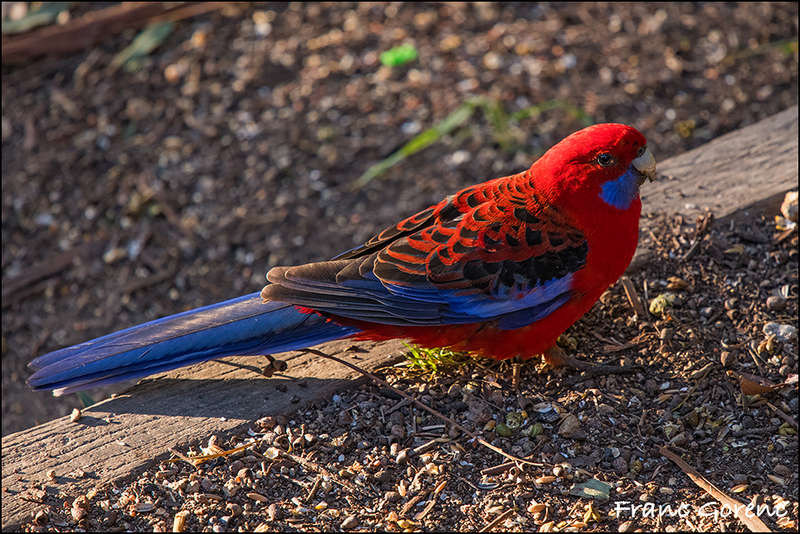 Already Crimson Rosellas were chasing each other around like race car drivers practicing their laps. Laughing Kookaburras were perched strategically, almost hidden by the leaves and dappled light, waiting to pounce on any unsuspecting organism that came within range. For the first time, Red-browed Finches (Neochmia temporalis) were feeding avidly on the bird seed we had scattered on the ground. 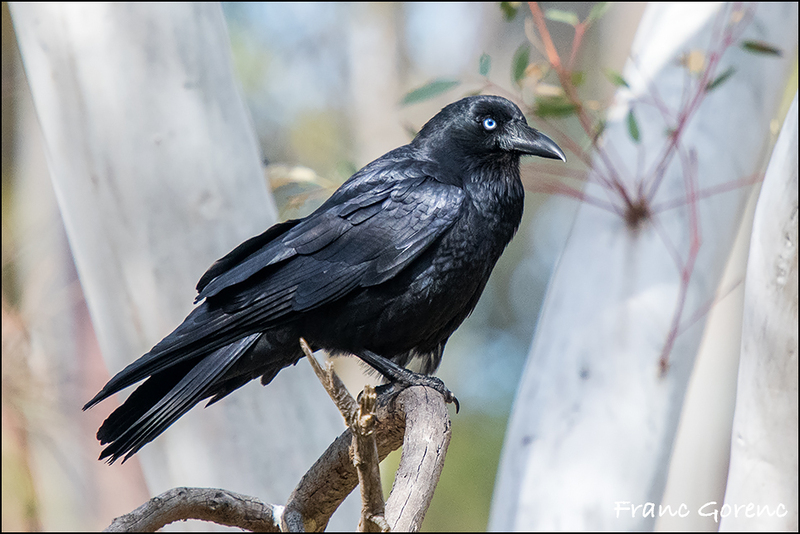 We packed up all of our gear and drove to the pretentious sounding Sherbrooke Forest and Birdsland Reserve, where Stewart awaited us. This is in every sense a magnificent forest, with trees stretching to the heavens, and fern trees resembling ancient cycads proliferating throughout. It was here that Miriam introduced me to the concept of forest bathing, meaning a total immersion into the forest structure, thereby receiving the therapeutic benefits it has to offer. In fact she proclaimed, and I agreed with her, that it was possibly the finest forest she had ever entered and she would willingly spend many hours in its embrace. 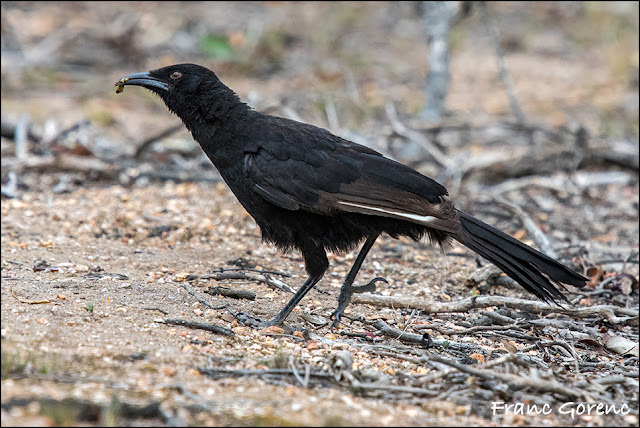 Our quest was for Superb Lyrebird (Menura novaehollandiae), known to occur at Sherbrooke in good numbers, and we saw ample evidence of its presence in the form of shallow pits excavated by its strong feet in attempting to uncover invertebrate prey. Numerous walkers passed us by, always with a cheery greeting, and the assurance that they had seen lyrebirds along the trail - two hundred metres from here, eight yesterday at such-and-such a location, they are always at this place.....and so it went. But, no lyrebird for us! I have never seen so many Crimson Rosellas as there were here; their numbers being closely rivalled by Sulphur-crested Cockatoos. Both a male and a female Australian Golden Whistler (Pachycephala pectoralis) presented themselves at close range, a vision to take your breath away if ever I saw one. 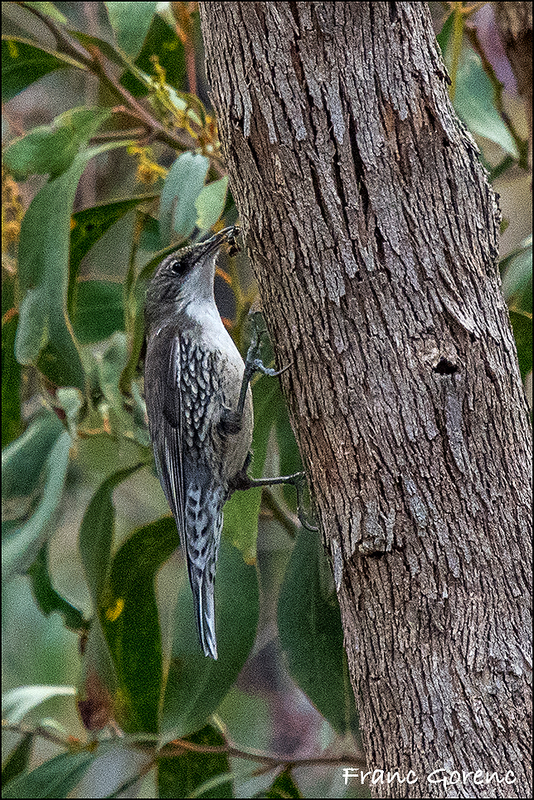 White-throated Treecreeper (Cormobates leucophoea) was quite common and we were able to observe its behaviour very well, even showing it to casual passers-by who were very interested. No doubt some of them were frequent walkers but had not previously been aware of this small and engaging bird. 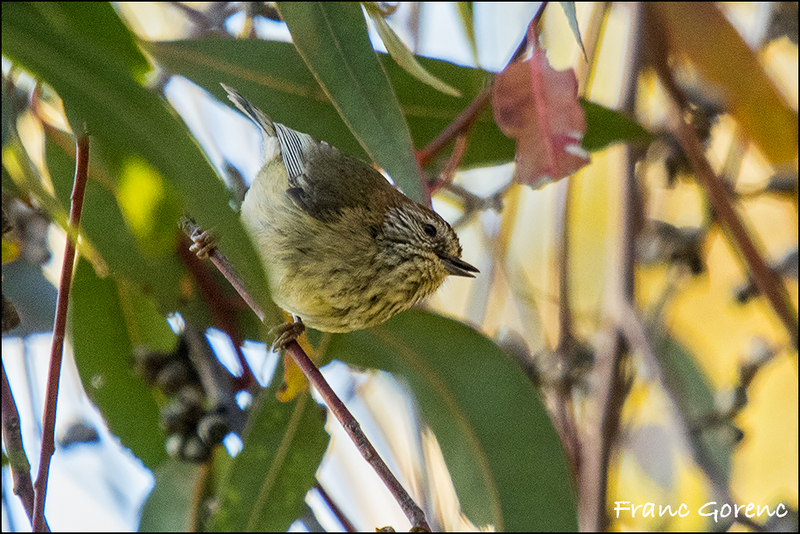 A Striated Thornbill (Acanthiza lineata) was a pleasant surprise. 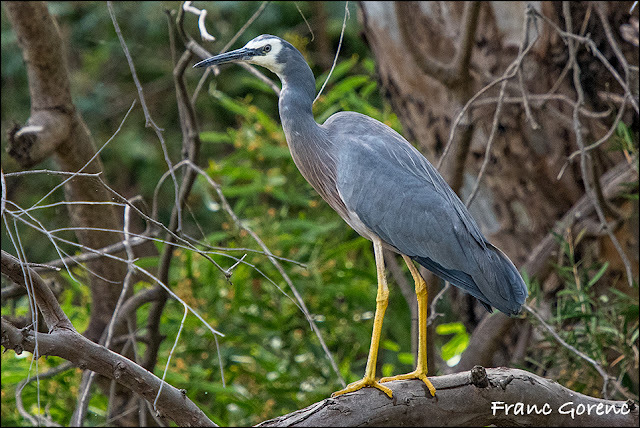 As we returned to the parking lot, we saw interesting birds, and enjoyed them very much, but still no lyrebird. We had dipped on this species along Lady Carrington Drive in Sydney and it looked like the same fate awaited us here. Stewart looked almost disconsolate and a little frustrated that his most reliable spot for the species had yielded nothing. But all was not lost. Just as we were about to leave the trail, Carol said, in a matter of fact tone, "There is a lyrebird." And so there was, not more than a few metres from where we were standing, scratching away at the soil and completely oblivious to our presence. 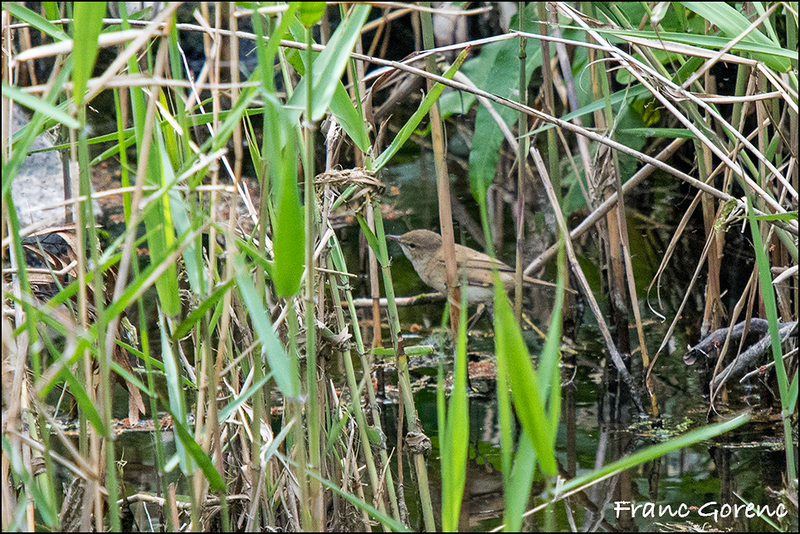 We watched it for about five minutes before it scooted away into the undergrowth. Great spotting, Carol! I had seen this species on my last trip to Australia, but only for two or three seconds as it sped across a road, so this extended view was exceptionally pleasing. 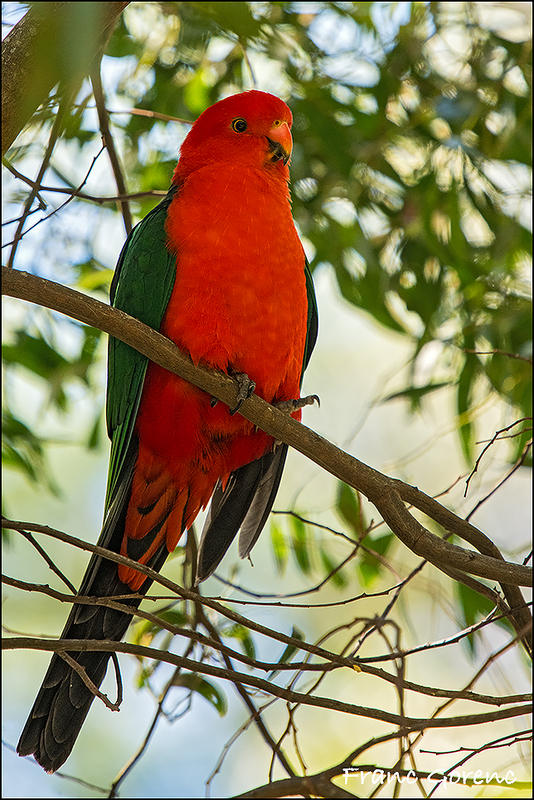 A couple of Australian King Parrots (Alisterus scapularis) were in the parking lot so we felt we had a regal send off. Stewart had told us about Seasons Restaurant in Cloudhill Gardens, an eatery that he and Sally particularly enjoy, and we went there for lunch. It was indeed very agreeable, and we sat outside amid flowers of every description. Miriam chose an herb and cheese roulade with salad which she said was first class. I chose the ploughman's platter and it was first class plus. I enjoyed a glass of fine Victoria Chardonnay with it, making for a memorable lunch indeed. Miriam finished with a cappuccino, I a skinny latte. We parted company with Stewart for the day, as he returned home and we sallied off to find our new accommodation. It was a large house, spacious and very clean, but painted entirely white on every wall and every ceiling, thus a little sterile, vaguely reminding me of a dairy. There was not a picture on the wall anywhere. We were unable to connect to the internet so the owner of the house came over to rectify that issue for us. He inquired as to what we planned on doing and when we told him that we intended to spend a day at Werribee he was very amused; in fact he thought we were joking. He had no idea that a water treatment facility could be such a world class birding location, renowned enough to attract visitors from Canada. We went shopping to get our final provisions to last us for the rest of our stay. Having had a substantial lunch, we ate sparingly for dinner. I had a toasted tuna sandwich and I didn't record what Miriam had. All species 12 October: Spotted Dove, Fan-tailed Cuckoo, Laughing Kookaburra, Galah, Sulphur-crested Cockatoo, Australian King Parrot, Crimson Rosella, Eastern Rosella, Supern Lyrebird, White-throated Treecreeper, Superb Fairy Wren, Eastern Spinebill, Crescent Honeyeater, Noisy Miner, White-browed Scrubwren, Brown Thornbill, Yellow-rumped Thornbill, Australian Magpie, Australian Golden Whistler, Grey Fantail, Magpie-lark, Australian Raven, Common Myna, Common Blackbird, Red-browed Finch. 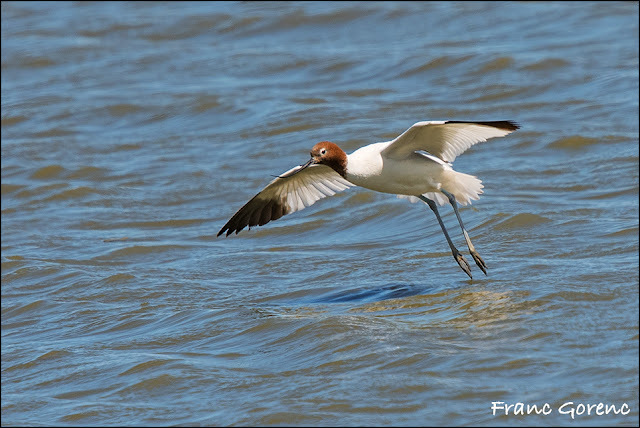 Werribee, or WTP as it is usually known, is deemed by some to be the best single birding location in all of Australia, and certainly in the State of Victoria. Thus, it was with great eagerness that we anticipated our visit there. We met Stewart at a predetermined spot and we all got into his car to begin our exploration of this huge area, relying on Stewart's prior knowledge of the best locations to find given species of birds. You will forgive me, I hope, for not knowing all of the different cells we visited, the roads we travelled, the gates we passed through, but our first stop was occasioned by the sighting of a Brown Falcon (Falco berigora) perched in a tree close to the road. Even after we stopped the car and got out the bird stayed put for a while, until finally it flew away. 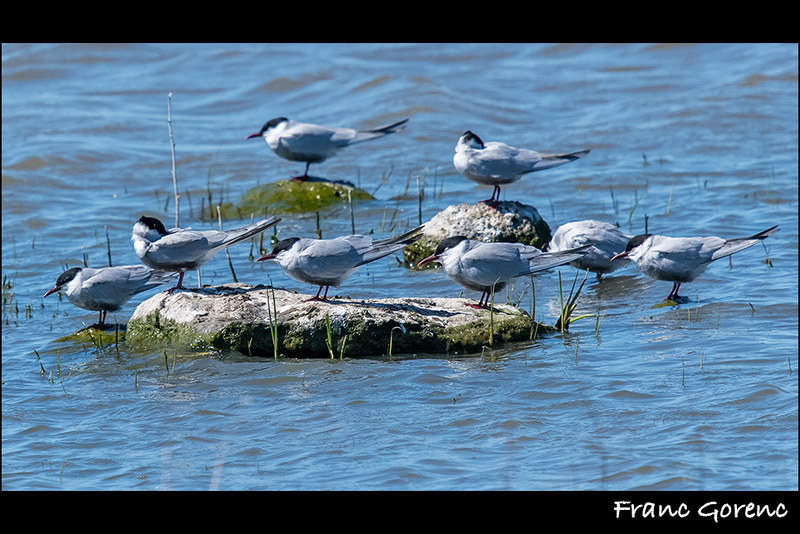 In the distance there were huge flocks of Whiskered Terns (Chlidonias hybrida) wheeling over the wetland, but I was especially excited when my binoculars connected with two Brolga (Antigone rubicunda) feeding at some distance. Ultimately they took flight and passed over our heads. I am very much an admirer of cranes and always relish the prospect of seeing them. A species never seen before adds a special glow to the encounter. 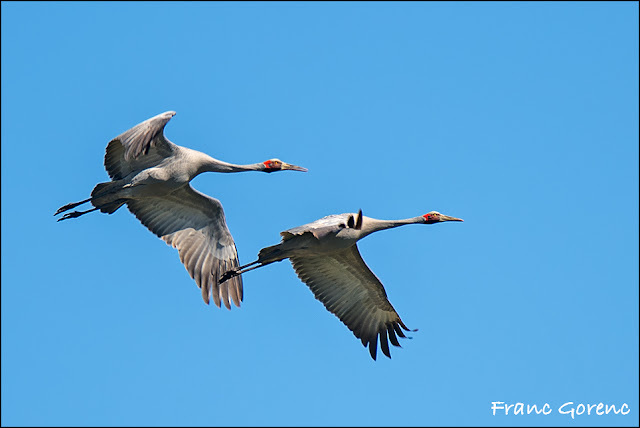 There are fifteen species of crane in the world and I have now seen eight of them. Were I twenty years younger I think I might embark on a quest to discover the other seven, but I doubt that I will now ever see them all. 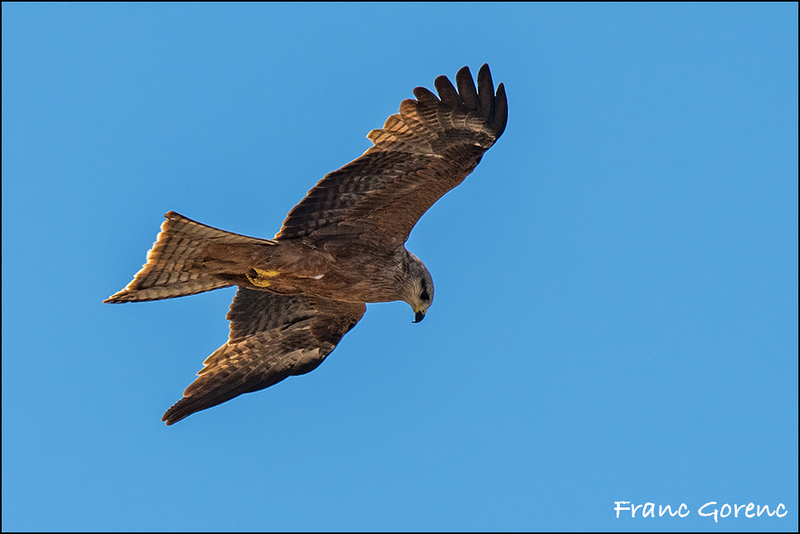 In a couple of different locations we observed Swamp Harrier (Circus approximans) methodically quartering the wetlands ready to drop down on any unsuspecting prey. 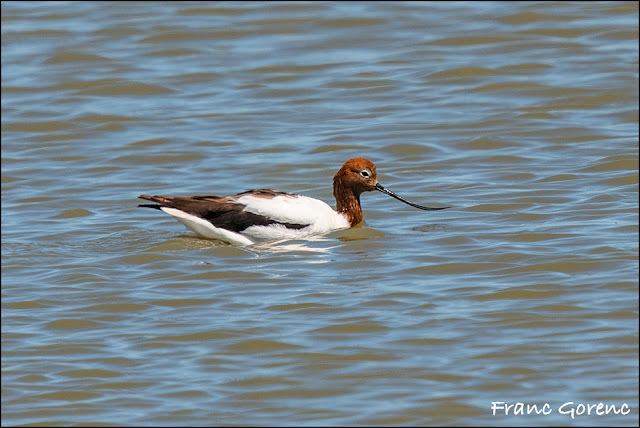 In a pond not far from our first stop there was a considerable number of Red-necked Avocets (Recurvirostra novaehollandiae), another enigmatic species that I had looked forward to seeing. 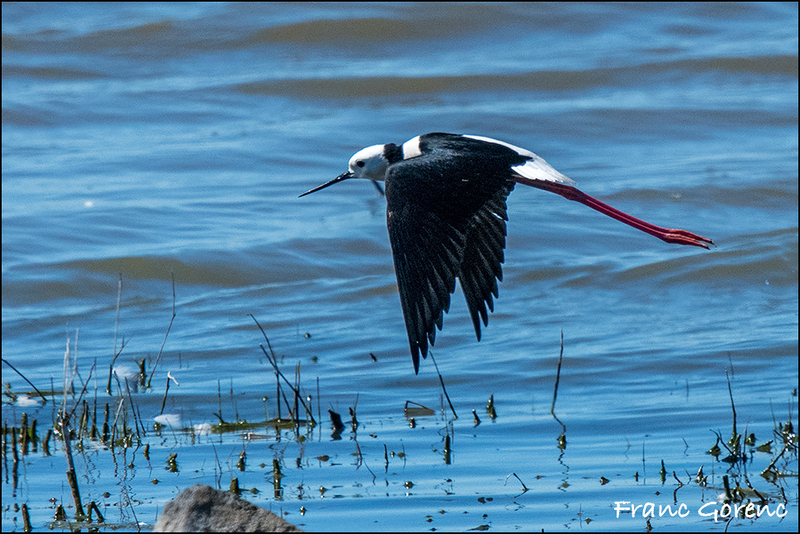 They were joined by their close cousins, White-headed Stilts (Himantopus leucocephalus), as they fed together using different foraging techniques, enabling them to share the same food resource. We also discovered Red-kneed Dotterel (Erythrogonys cinctus) and Black-fronted Dotterel (Elseyornis melanops) in the same lagoon. We checked out a couple of hides. One has to be a little careful before entering! Whiskered Terns were pleasingly close. 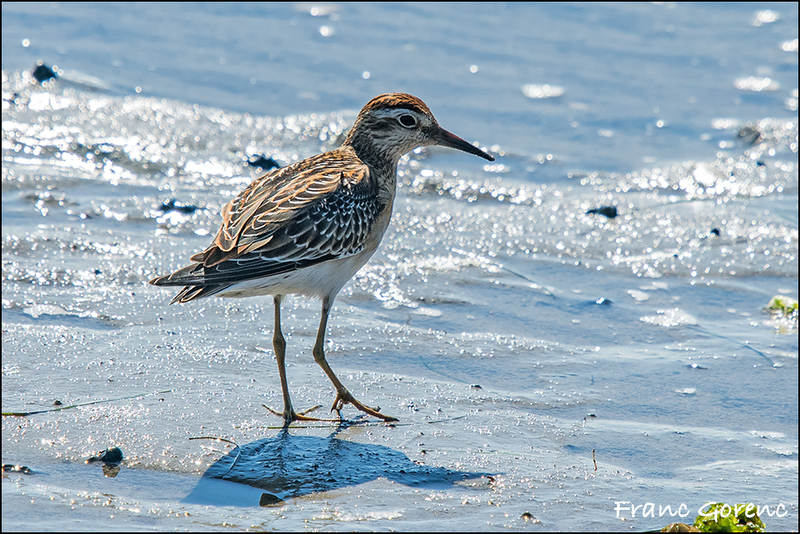 Sharp-tailed Sandpiper (Calidris acuminata) was far and away the most common shorebird, many still in breeding plumage. 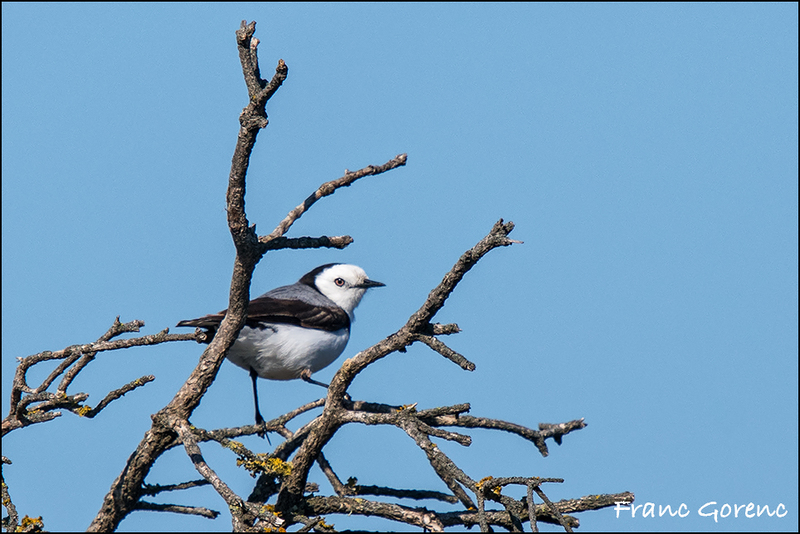 Each sighting of a White-fronted Chat (Epthianura albifrons) engendered a new sense of delight. Carol commented that it was one of her favourite birds. Stewart knew of a location where rails and crakes are often found so we ate our lunch there, all the while keeping a keen eye on the marsh. 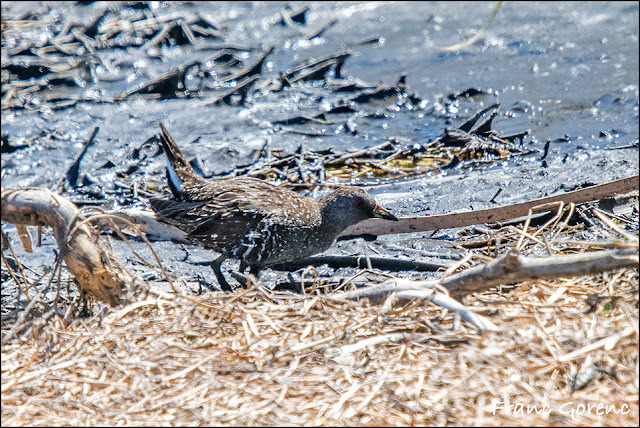 Suddenly Franc called out, and I thought he might swallow his sandwich whole, as he pointed to an Australian (Spotted) Crake (Porzana fluminea) venturing out of dense cover and walking around on the mud. He rushed to get his camera, but the obliging bird remained visible for several minutes. An incoming tide was pushing it up onto dry land. We continued our exploration of the area, driving up and down various roads connecting to lagoons. I should point out that one has to purchase an annual permit to visit WTP which includes a key to open the locks on the various gates. I was a dutiful gateman that day, hopping out to open and close the gates, always making sure they were locked when we left. 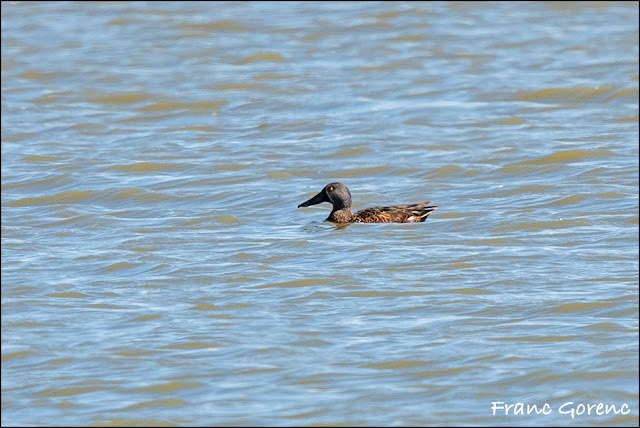 Our only sighting of Australian Shoveler (Spatula rhynchotis) occurred at Werribee. 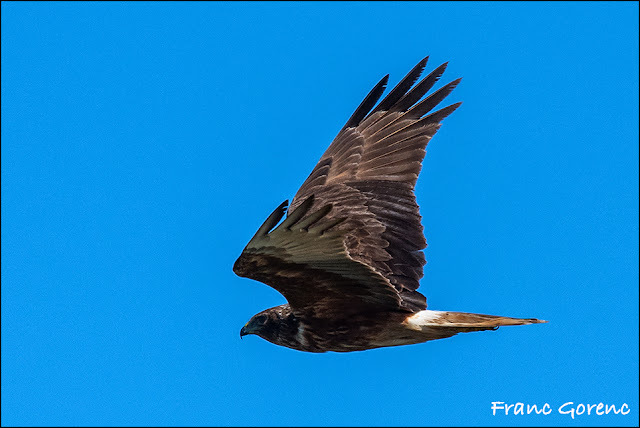 Black Kite (Milvus migrans) was frequently seen flying over the wetlands, no doubt searching for carrion or live prey within its capability. 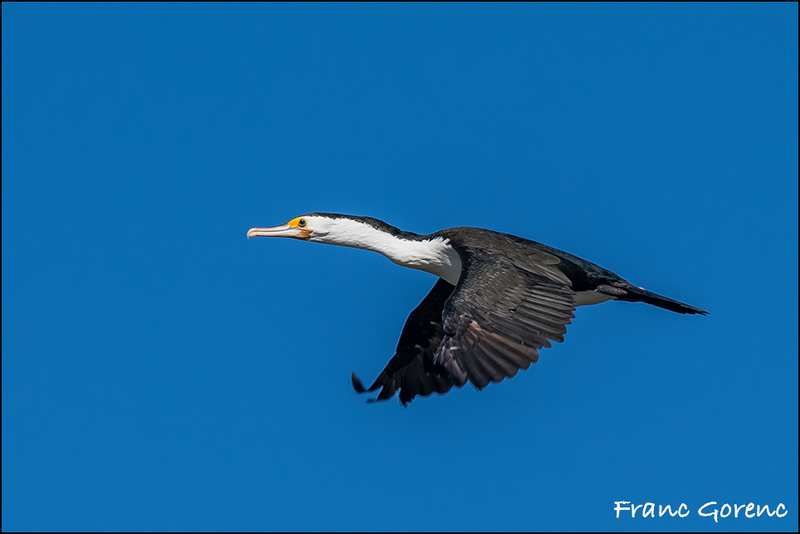 Australian Pied Cormorant (Phalacrocorax varius) sailed effortlessly overhead. At various points throughout the WTP there were signs advising of a fox eradication programme involving poisoned bait. Human folly at its worst! Rabbits were brought in by early settlers and they quickly assumed plague proportions, so foxes were imported to help to control rabbits, and the foxes have now proliferated and are a serious threat to native wildlife throughout much of the continent. Will we ever learn to leave nature alone? Maybe you should chat to the folks in Queensland about Cane Toads! When it was time to leave, Miriam and I rode with Stewart as we all proceeded directly to his house, with Franc and Carol following close behind. We were to have the grand experience of a barbecue, with all the pleasure of an evening spent with the Monckton family. How I looked forward to this delicious event! 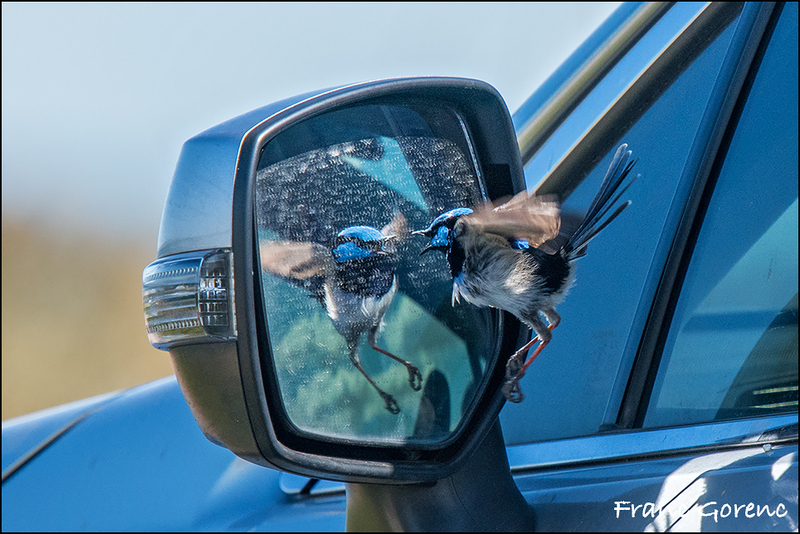 A male Superb Fairywren (Malurus cyaneus) seemed to be having a grand squabble with himself in the vehicle's rear view mirror! Sally had worked hard to prepare everything for us, and it was perfect from start to finish. Fellow birders reading this account will understand how agreeable it was to come back from a long day in the field to Prosecco, and fine cheeses and crackers served outside in the garden. The whole Monckton family was there to magnify our delight, with cheerful, enervating, intelligent conversation. It is instantly apparent that Hamish and Pippa have inherited a full measure of conviviality and intelligence from their parents. Their quick wit is even bent in the same obtuse direction as Stewart's! Dinner was nothing short of a feast with barbecued lamb, garlic bread, a lettuce and avocado salad, tzatziki, a constantly replenished glass of wine, and fabulous dessert. I believe it was Stewart who commented that we were having a Greek barbecue in Melbourne. No doubt the finest of Greek chefs would have approved of this this repast and would have given it their highest seal of honour. When it was time to leave it was with more than a touch of sadness, for we would not be seeing Stewart or his family again (at least not on this trip). Stewart had to leave two days later on a business trip to Europe, and there was preparation to be done. There are not words enough to express my profound gratitude for the hospitality we received, and the many kindnesses from Stewart, Sally, Hamish and Pippa. These people, in one form or another, will be part of my life forever. For the time being warm memories will have to suffice, but who knows what the future will bring? We were home around midnight and went to bed soon after. All species 13 October: Black Swan, Australian Shelduck, Pink-eared Duck, Maned Duck, Pacific Black Duck, Chestnut Teal, Hardhead, Musk Duck, Australasian Grebe, Hoary-headed Grebe, Australian White Ibis, Straw-necked Ibis, Great Egret, White-faced Heron, Australian Pelican, Little Pied Cormorant, Australian Pied Cormorant, Little Black Cormorant, Great Cormorant, Swamp Harrier, Black Kite, Australian Crake, Australasian Swamphen, Eurasian Coot, Brolga, Pied Oystercatcher, White-headed Stilt, Red-necked Avocet, Masked Lapwing, Red-kneed Dotterel, Double-banded Plover, Black-fronted Dotterel, Sharp-tailed Sandpiper, Curlew Sandpiper, Red-necked Stint, Common Greenshank, Silver Gull, Whiskered Tern, Spotted Dove, Crested Pigeon, Laughing Kookaburra, Brown Falcon, Galah, Superb Fairywren, White-fronted Chat, Little Wattlebird, Brown Thornbill, Yellow-rumped Thornbill, Australian Magpie, Black-faced Cuckooshrike, Willie Wagtail, Grey Fantail, Magpie-lark, Australian Raven, Eurasian Skylark, Welcome Swallow, Tree Martin, Golden-headed Cisticola, Silvereye, Common Myna, Common Starling, Common Blackbird, House Sparrow, Australian Pipit. Everything we read about You Yangs Regional Park indicated that directions were well signposted on the highway. They were not! With four sets of eyes scanning we saw no sign at all. We pulled off at a service centre and I asked a fellow putting air in his tyres whether he could help us. As it happened we had missed the turn just a few kilometres back, but the way onto the highway in the reverse direction seemed unreasonably complicated and involved a u-turn. This very kind man, having difficulty even explaining to us what we had to do, suggested that we follow him and he would take us where we needed to go. He literally took us right to the road that leads up to the park, so that all we needed to do was to go straight. If I knew his name I would write a letter of appreciation to his local newspaper! He certainly rendered a great service to us and we were very grateful. The park initially did not seem to offer good birding, but as the day progressed it improved somewhat. There were many different trails furnishing varying degrees of success. As had been the case in other parks, evidence of fire was all around. 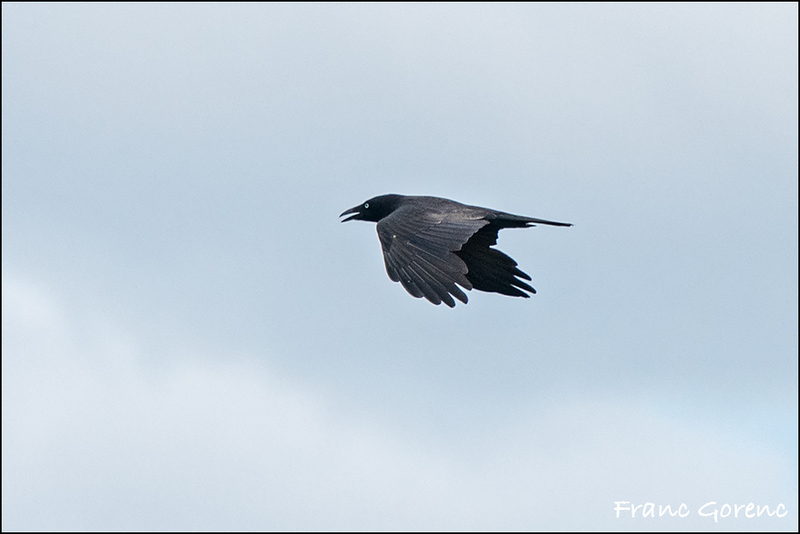 We sighted this bird passing by and believe it to be a Little Raven (Corvus mellori), our only sighting of this species for the entire trip. 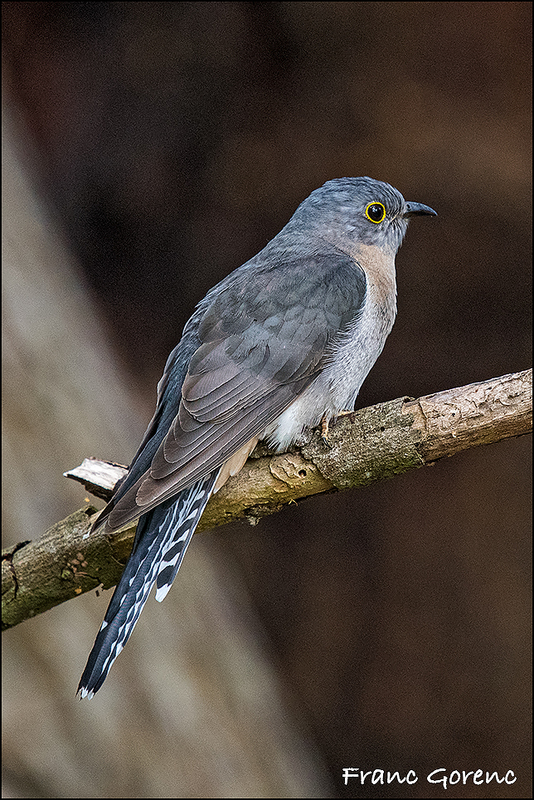 The bird of the day was undoubtedly Pallid Cuckoo (Cacomantis pallidus) perched in full view for several minutes. A Grey Shrikethrush (Colluricincla harmonica) was seen in the same general area. 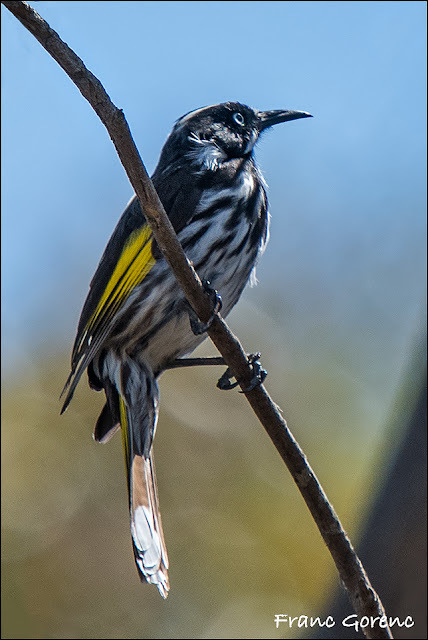 Our old friend, New Holland Honeyeater (Phylidonyris novaehollandiae) was never far from view. And nor was Sulphur-crested Cockatoo. 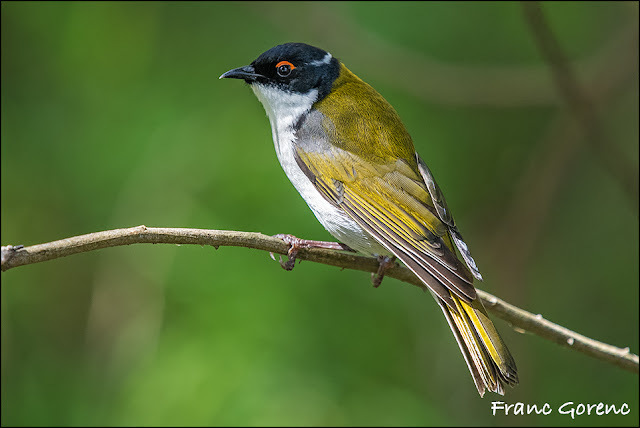 There is certainly a degree of elegance to a White-plumed Honeyeater (Ptilotula penicillata). Franc went off bushwhacking by himself, while the rest of us stayed in the vehicle observing substantial bird activity from the road, mainly Scarlet Robin (Petroica boodang), with several young birds still consorting with their parents, and Rufous Whistler (Pachycephala rufiventris). 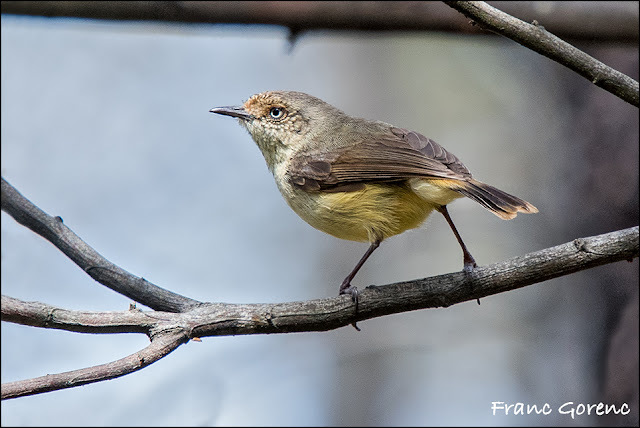 A Buff-rumped Thornbill (Acanthiza reguloides) also put in an appearance. 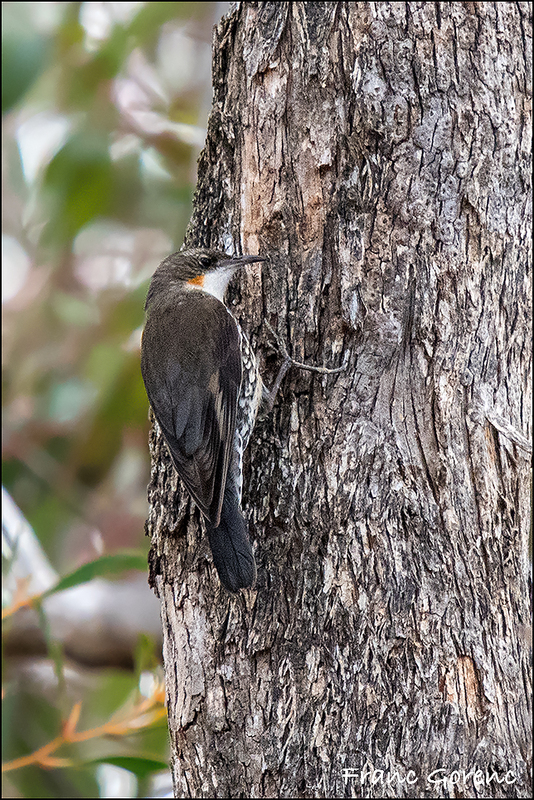 And both male and female White-throated Treecreepers were hitching their way up a trunk in search of insects, spider eggs and the like. We had not walked a whole lot that day, but I think a general level of fatigue was starting to build up based on extensive, and often strenuous, activity every day. Had we been staying much longer I think that Miriam and I would have needed a day off. And it must be remembered that Franc is far and away the youngest member of the group, a full sixteen years younger than me. We left You Yangs at 16h:30 and drove directly "home." We all had a glass of wine, with brie and crackers - a nice way to wind down a little. Dinner was barbecued steak, baked potato and salad. All species 14 October: Australian White Ibis, Spotted Dove, Crested Pigeon, Pallid Cuckoo, Laughing Kookaburra, Galah, Sulphur-crested Cockatoo, White-throated Treecreeper, Superb Fairywren, New Holland Honeyeater, Red Wattlebird, White-plumed Honeyeater, Weebill (Franc only), Buff-rumped Thornbill, Australian Magpie, Pied Currawong, Black-faced Cuckooshrike, Varied Sitella, Rufous Whistler, Willie Wagtail, Grey Fantail, Magpie-lark, Australian Raven, Scarlet Robin, Common Myna, Common Starling, Common Blackbird. We had only the morning to bird, since the car had to be delivered back to the rental agency in the afternoon, so Franc, Carol and I went to Brimbank Park in Keilor, a mere nine minutes from our B&B. Miriam decided to relax instead of taking part in one more birding foray. We parked amid mature gum trees harbouring a raucous gathering of cockatoos and parrots. Although all the species were familiar, I was starting to really pay attention to them, knowing that within a day I would not be seeing any of them for a very long time, possibly ever. The courtship behaviour of Rainbow Lorikeets (Trichoglossus moluccanus) was especially endearing, but this has been covered in an earlier post. Several Australian White Ibis flew overhead, their crisp plumage glistening in the bright Australian sun. We thought we would get a coffee at a restaurant but it was unfortunately closed. Another couple showed us a Common Brushtail Possum (Trichosurus vulpecula) sleeping under the eaves; apparently it passed away the daylight hours there every day. 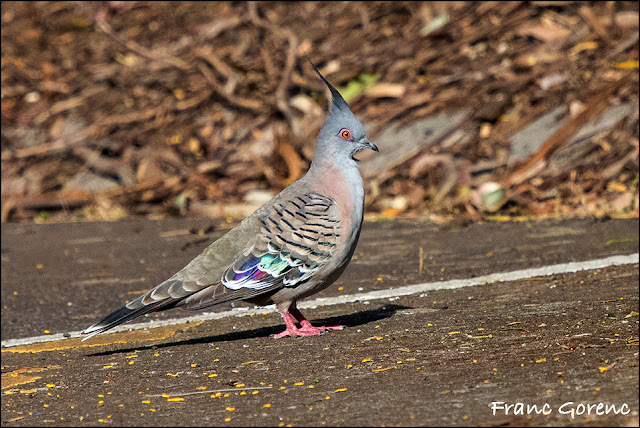 Crested Pigeon (Ocyphaps lophotes) promenaded up and down, gob smacking in its iridescent beauty. We had our only sighting of the entire trip of Australian Reed Warbler (Acrocephalus australis); I suspect they had recently arrived from their winter haunts in Asia. A White-faced Heron (Egretta novaehollandiae) stalked its prey in the shallows and along the bank of the stream. A Dusky Moorhen (Gallinula tenebrosa) sat tight on its nest. The thought occurred to me that a nest is the closest thing any bird ever gets to what might be considered a home, and even that it temporary. The young will barely even call it that, since once they emerge from the egg these precocial chicks will leave the nest for the security of the water within hours of hatching. We believe that this bird is a Forest Raven (Corvus tasmanicus) and not the more familiar Australian Raven (Corvus coronoides). We returned "home" around 12h:15 and had lunch on the deck. While I had a nap, and then relaxed for a while on the patio, Franc and Carol left for Melbourne Airport to return the van to the rental company. Carol had picked up more brie, so we sipped wine and enjoyed cheese and crackers. Dinner was barbecued pork chops and cabbage salad, eaten on the deck - our final dinner in Australia. All species 15 October: Pacific Black Duck, Australian White Ibis, White-faced Heron, Brown Goshawk, Dusky Moorhen, Spotted Dove, Crested Pigeon, Galah, Sulphur-crested Cockatoo, Red-rumped Parrot, Rainbow Lorikeet, Superb Fairywren, Red Wattlebird, Noisy Miner, White-plumed Honeyeater, Australian Magpie, Willie Wagtail, Magpie-lark, Australian Raven, Welcome Swallow, Australian Reed Warbler, Silvereye, Common Myna, Common Blackbird, House Sparrow, Red-browed Finch, European Goldfinch. We had an early morning flight, so needed to be up by 04h:30 to grab a quick bite, finish packing and be ready to go when the taxi picked us up. I checked my emails and learned that our flight was now later than previously scheduled, that we would miss our connection in Hong Kong, and would have to overnight there. At the airport Cathay Pacific gave us each a food voucher, which covered a delicious fruit salad and a coffee. When we finally got underway, there was a medical emergency on the plane, so we were delayed even further upon arrival in Hong Kong. It didn't really matter for us, but it was getting desperate for people with connecting flights. One woman was especially distraught at having missed her connecting flight to Hanoi, where she had an important meeting to attend. Cathay Pacific ground staff greeted us and gave us vouchers for the Marriott Hotel, with a HK$200 food voucher for dinner also. We got the shuttle to the hotel which was very close to the terminal. The dining room had a set menu covering the cost of the voucher, and it was pretty dismal fare. We started with a corn chowder soup, which was passable, but it was followed by seafood fried rice, that barely resembled fried rice, and was for all intents and purposes tasteless. Miriam picked butter chicken with poppadoms and rice, and she had by far the best of it. We all got a glass of orange juice that was part of the meal. The room was spacious and well appointed, the bed very comfortable. We snuggled up early and were soon asleep. The dining room at the Marriott hotel got transformed from mediocrity to superlative overnight. There was dim sum for breakfast! Yippee! It doesn't get any better than that. There was also a whole host of other stuff served buffet style, but nothing could lure me away from sticky rice, shiu mai, and cha siu bao (dumplings with spiced pork nestled inside), turnip cake and other delights too! On top of that, the coffee was really good! We took the shuttle to the airport, a mere five minute ride, and were in the boarding lounge long before our departure time. The flight home was long but routine and I got a little sleep. Jim was there to meet us on arrival in Toronto, and we had a smooth drive home, despite being delayed for a while by a collision on Highway 401. It was good to walk though our own front door again. Every now and then when I read your blog -- actually, more often than not -- I audibly gasp and say such things aloud as "Wow," or "Ohhh!" And Rick invariably says, "What's wrong?" Not a thing. I am just dazzled by the photos and your narrative which is not only informative about birds, but just so darned much fun as you recount your experiences. Stewart and Sally sound like kindred spirits and with the hospitality on can only imagine. The trip itself -- a dream come true, right down to the dim sum. I wonder if you are back in the right time zone mentally by now and hope so! Meanwhile, thanks for sharing each memory, each photo. Thanks, too, for popping over to my blog. I love your comments. You mentioned learning French. I know a bit (I could actually read what you wrote in French on the blog without Google translate!) but not enough to follow when people speak at a normal rate of speed! There is much to learn but constant practice would be a big help! 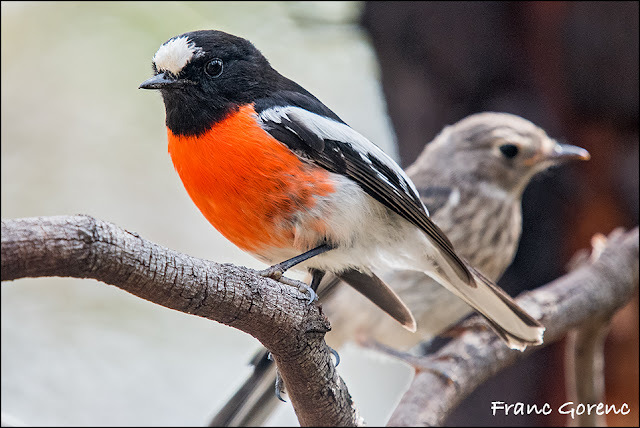 Hello, awesome report on your birding in Australia. 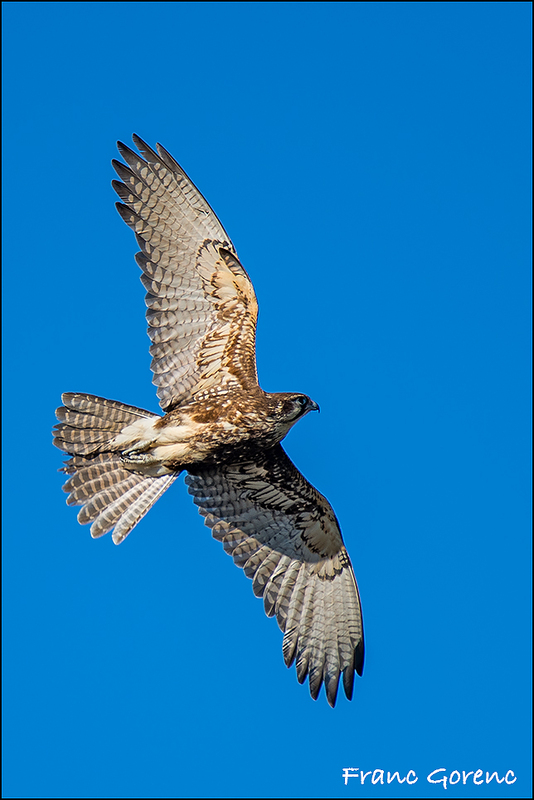 The variety of birds seen and photographed is just awesome. I love would love to see them all myself some day. It is a beautiful country and your outings were wonderful. Thanks for sharing your trip! Have a happy day! There are lots of good deals on flights to Australia, Eileen! Amigo David, ¿Que decir? me dejas con la boca abierta y sin palabras para poder expresar tanta belleza. Precioso reportaje de libro, y precioso todo en su conjunto una maravilla. Mis felicitaciones por tan productivo viaje y mis felicitaciones a Stewart gran acompañante de lujo y al amigo Franc por tan extraordinarias y maravillosas fotos. I enjoyed reading about your travels in Australia. The photos are absolutely beautiful and your narrative takes the reader right along with you. Glad you had a fantastic time and thank you for sharing so we all can appreciate your expertise on birding. Well done! Uma variedade enorme de aves que eu nunca irei ver aqui no Sul da Europa - Portugal. Uma grande aventura por Victória! Great post and magnificent pictures from your trip in Australia! So many species of beautiful birds! I know Stewart,and his blog. 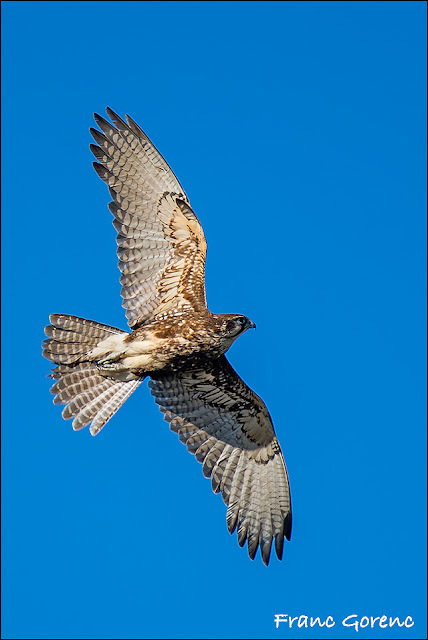 He’s a great photographer,and birdwatcher too. I really enjoyed reading about your experience with the wildlife and birds in Australia! What a fabulous end to your Australian adventure, David. The whole account has been rivetting from start to finish. So pleased to hear that you met Stewart and his family, and that your experience confirmed the impression that his blog gives of him. Your species total for the whole trip must have been huge - do you have a figure? Hi Richard: I have a total for each state, but of course there is overlap from one to the other. At some point I will figure out a total for the whole trip. It's so nice to read about your trip to Australia. The photos are so beautiful. Lovely to discover your blog and thanks for visiting mine. Your trip to Australia must have been wonderful and seeing all the birds and wildlife. Our daughter lived in Keloir when she was working in Melbourne. 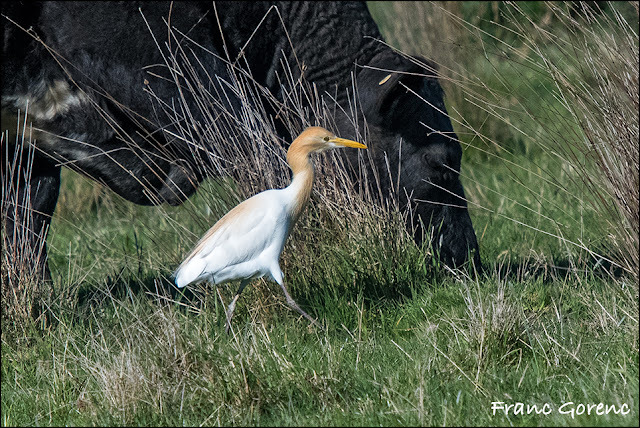 There are some amazing wildlife in Australia but some I would rather not meet like crocodile, snakes etc. 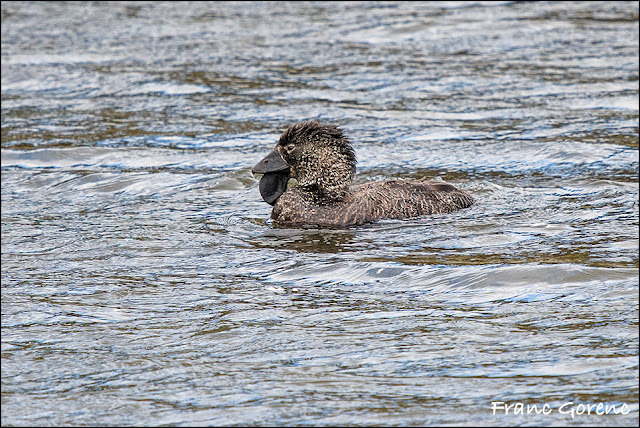 Fantastic birding Franc, Australia must be for birding. David, your choice is beautiful. ¡Cuánto material y todo maravilloso! Un viaje que supongo será inolvidable. Un abrazo desde Galicia, España. 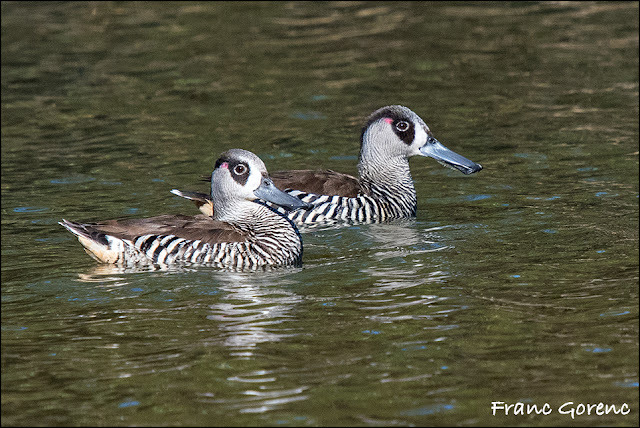 So many wonderful birds, the pink eared duck is just insane!! And the Koala what a treat!! Franc's camera work...brilliant. Wow. You certainly saw lots of new species. 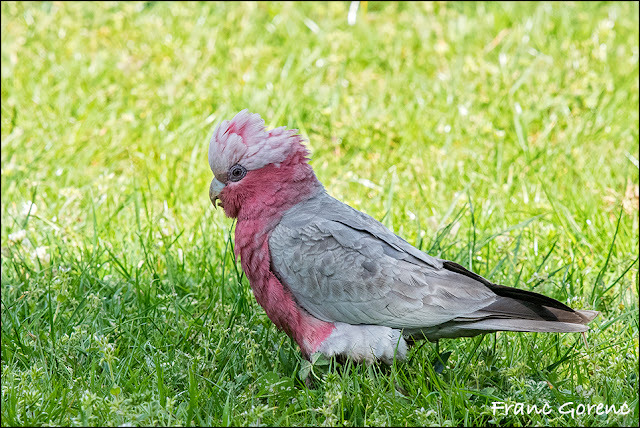 Like the mammals of Australia, the birds are really unique too. It sounds like it was a fabulous trip, and even a bit of time in Hong Kong too and some fantastic Asian breakfast. What an adventure it was. 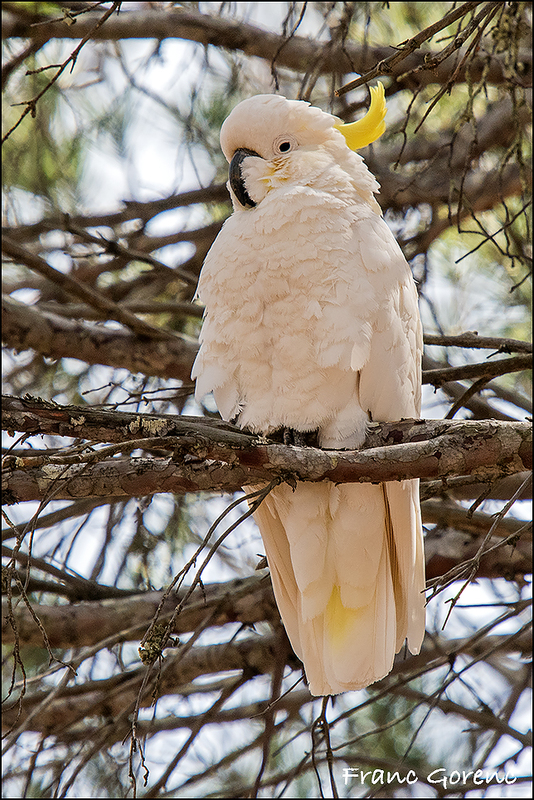 So many beautiful birds in Australia. 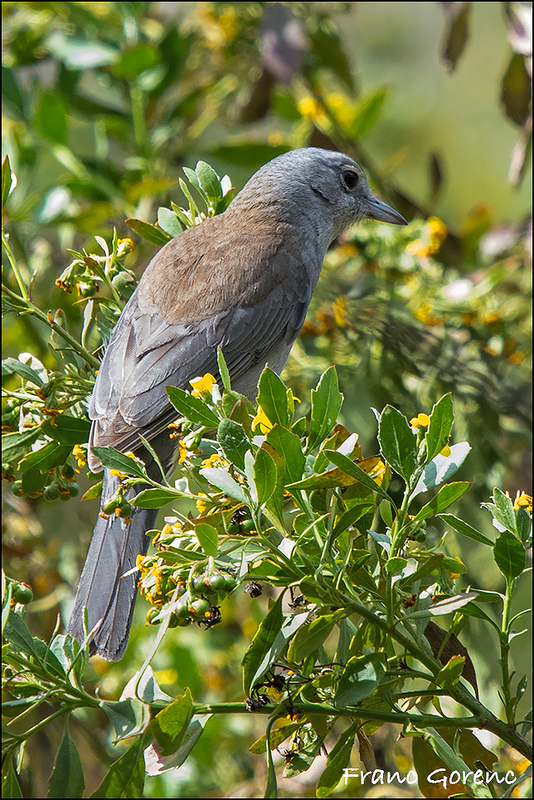 All of those birds are wonderful,especially I enjoyed the image of " A Black-faced Cuckooshrike with a morsel.Something funny! 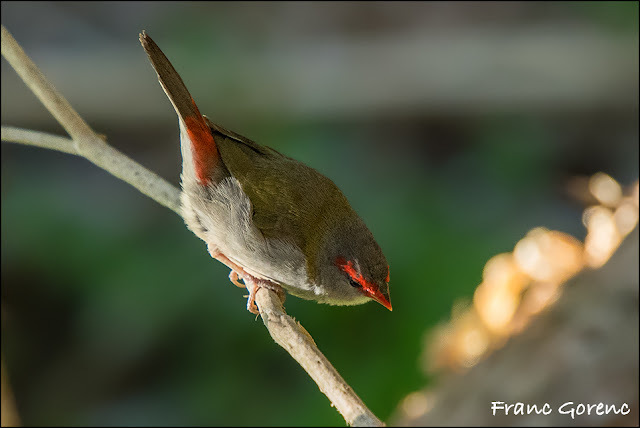 Our birds are shown off to the highest degree, such clear photos and what you have written is wonderful. It's pleasing you found so many different birds in that area.. It sounds as if your trip MORE than lived up to your expectations. I am very, very glad to hear it. And marvel at both the commentary and beautiful photographs. Each bird has its own beauty with its different make up and dressings (feathers). I like the babies following their mother, and the one squabbling with its own image. Lol! Words are not enough.. jag säger bara tack David för att du delar dina upplevelser och alla dessa unika bilder av fågellivet i Australien med dina läsare. Tänk, jag visste inte ens att det i verkligheten finns svarta svanar! Ditt bidrag till min allmänbildning är sannerligen betydande. Wonderful photographs and entertaining narrative as I've come to expect on your blog. Looking at the pictures I can't help but be astonished at the sheer diversity of colour and shape that birds have assumed, presumably all vital to their survival if C Darwin is to be believed. Some of these look as though they must originate from very imaginative children being given coloured pens and told to design a bird! What a beautiful species of birds shows you. What a pleasure this is to see. Thank you for letting us take a look. It's great to follow you with all the details. The birds are beautiful ! I love Eastern Spinebill and I hope to see it. I'm also wondering about going to the penguin parade ! Yes, it's very Disney Land. You have to have a chance to see the penguins, but it's hard, isn't it ? Like you, we will go to see koalas for birds in particular. And WTP is the corner to do absolutely !!! Make sure you get a permit for WTP, Nathalie, otherwise you will not be able to access most of it. We had the benefit of riding with Stewart who already had his annual pass. Hi Nathalie: somehow or other, I have no idea how, I just deleted your comment above, for no reason, I assure you! Thank you for your informations ! I checked the WTP site. Increíble reportaje, lleno de magníficas fotos, algunas son geniales. A marvellous series of posts, thank you, and all the more enjoyable for coming not long after I was in Australia myself. Hi David. I'm blown away (hope that phrase is OK?) by this latest write up. If anything the birds are more colourful, spectacular and outstanding than your previous posts, and your narrative exceptionally stimulating. It does sound that through Blogger, Google and the much-maligned Internet you found some new and special friends. 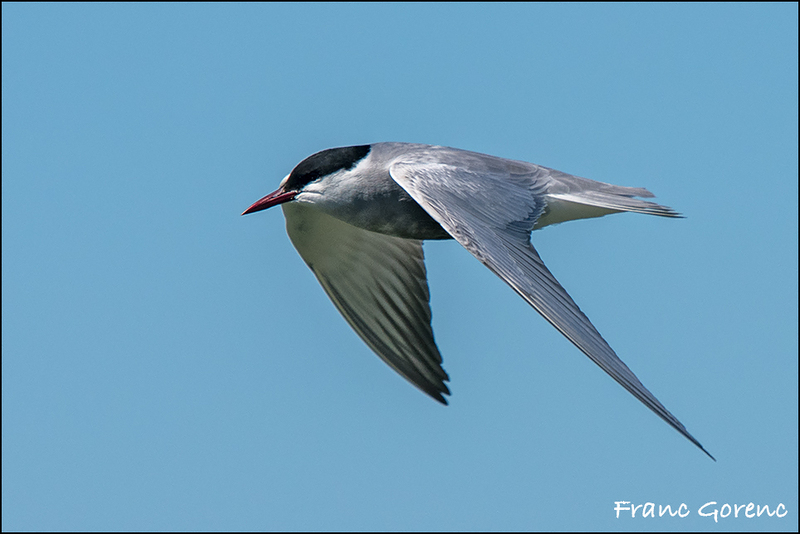 Thanks to Franc again for his brilliant photos. I am blown away by your comment! As for the friendship - the kind that only comes along once in a very long while. David, you found a heaven where so many wonderful birds! The photographs are so beautiful! As I began to peruse your post, I realized it was not a post. Rather, an epistle, a travelogue, a diary, a field report and a nature-lover's dream journey. Thank you so much for sharing it all! I was going to comment on specific images or experiences but was afraid I would be reduced to "cool" in too many instances. Words are at times simply inadequate. Very happy you got to know Stewart and his family as he seems, through his writing, to be a very special individual. Again, thank you for sharing an incredible adventure! Thank you very much, Wally for this warm comment, and thanks especially for stopping by my blog. Hi David - it does sound as though your organisation and expectations were absolutely right to 'the tee'. Amazing range of birds with such apt descriptive names ... I must look into improving my vocabulary more readily in my comments. I don't use neat or cool ... but should extend my thoughts when I comment/ reply to comments. So wonderful that you formed a great friendship with a blogger with similar interests and that his family was so welcoming. 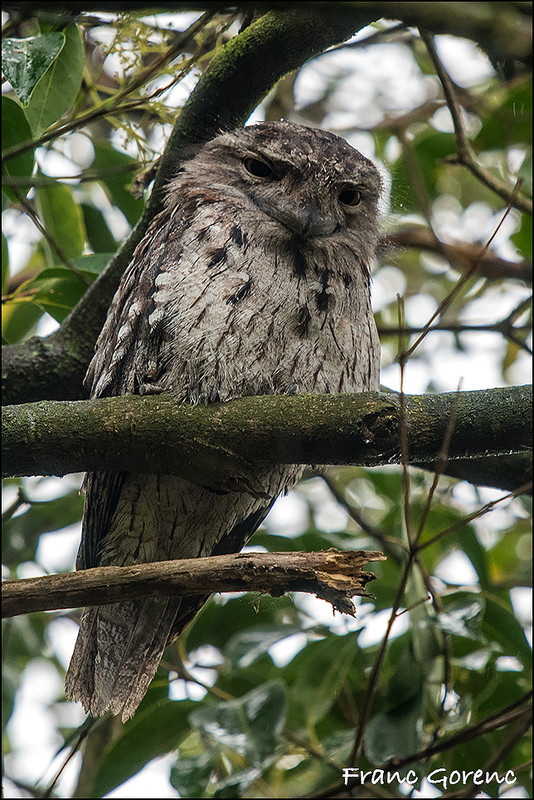 The Tawny Frogmouths are very cute, I've only seen them in animal parks. Hi David, what a great reminder of how birdy Australia can be ! Not only birds, John, but with some truly interesting, unique families and species. I feel breathless, just reading about this trip. So many amazing (not cool or neat, AMAZING) birds, day after day. I'm glad the lyrebird showed up. The Toyota van reminds me of the one we had in the late 80s/ 90s and drove for nearly as many miles. We loved that thing. i was preparing my very humble "duck" post for tomorrow and decided to take a break, to come here and browse around. 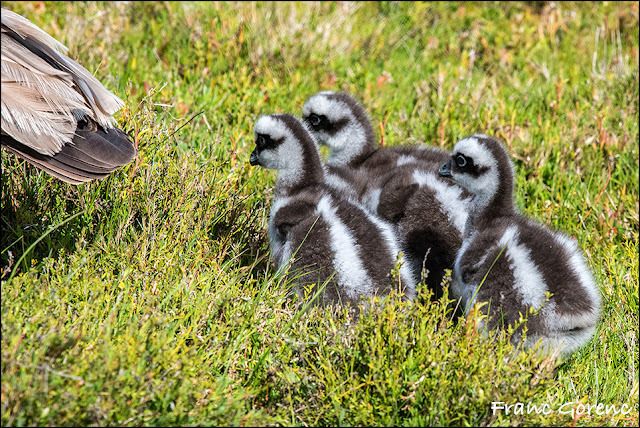 i am overwhelmed by your trip, by the beautiful images franc took. i enjoyed miriam's images of the landscape as well. i enjoy these diaries you keep, but in my very humble opinion, i think you should break them up, into maybe 2 or 3 posts...as i will have to come back to finish reading. i read the first half, then i had to "skim" and i feel bad about that!!! i liked that warning sign, about the snakes!!! i had several favorite birds, the bright, vibrant colors are amazing. 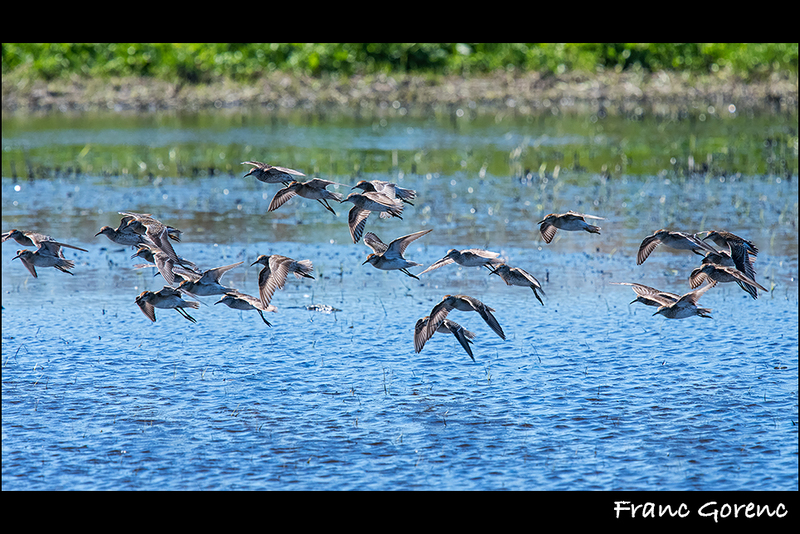 i can't imagine the thrill of seeing them flying about free in nature! You might be right, Debbie. We visited three states and I broke it down into three segments, one covering each state, and I was reluctant to divide it up further. A most enjoyable travelogue and field report of your visit to Victoria. Some stunning images of some outstanding colorful birds, well done to Franc. We have an hide at Rutland with a warning about snakes but they are only grass snakes, not the nasties you can find in Australia. Wow, epic post! You visited quite a few of my favourite birding places! 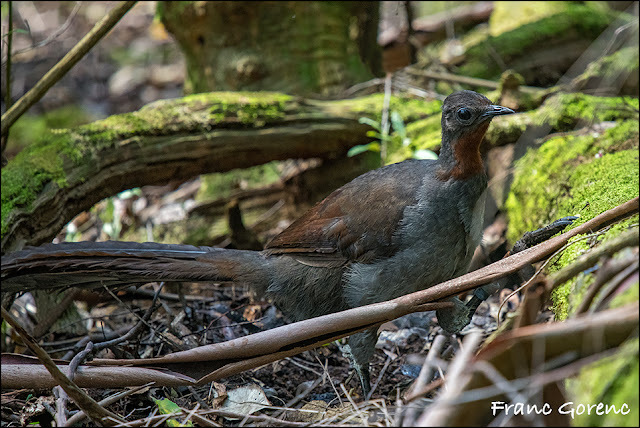 I'm glad you managed to catch up with a lyrebird, and seeing the shearwaters some in to their burrows is an amazing sight, if you do get a chance to see it. What a wonderful post - the images are stunning and so beautiful. It must have been a truly awesome holiday. It was lovely to see the koala bear as well as so many colourful birds. A great read and thank you. Hello David, This is a great trip report. The bird photos are awesome, great sightings. The Tawny Frogmouth is a cool looking bird, kind of reminds me of the Great Potoo I saw in Costa Rica. Thanks so much for linking up and sharing your post. Happy Saturday, enjoy your day and weekend! BTW, Brigantine and Edwin Forsythe are one and the same. There are other parts of Brigantine too. PS, thanks also for leaving me a comment. Wow, what an epic trip. So many pictures to like and hard to select a favourite. I enjoyed them all. 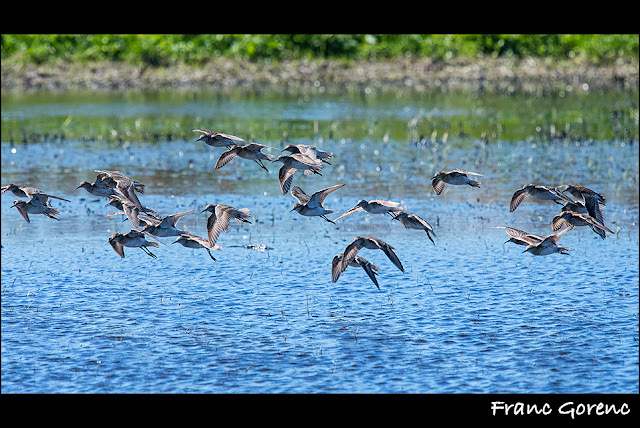 I agree, picking favourites is wel nigh impossible, but the Brolgas were special to me. But then, so was everything else! Hello! An interesting travelogue and great photos. 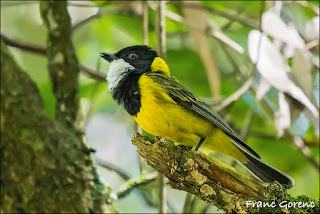 You have seen so many birds on your trip! Wow, what a fabulous series of pics! Each is so special and great captures of them. It took me some time to take a close look at all these marvellous birds you've seen. Many of them so colorful. And all beautiful. Or funny, like the wren fighting itself in the car's mirror. I enjoyed "travelling along" with you in your blogposts. It took me a while to get through this post, but it was well worth the time. The pictures are amazing and I enjoyed the narrative. Thank you! really incredible what you show here. The most beautiful birds pass by and my mouth is already open. Breathless view all this beauty and what is eht then a wealth to see these beautiful animals. Really great what you show and I enjoyed it immensely. I agree that the online translators are pretty poor, Heenán, so like you I always struggle through and read your blog in Spanish, and my proficiency in Spanish is considerably less than your excellent command of English. Sorry for the typo on your name, Hernán! David - marvelous storytelling. And then the bird pictures. Radiant. Stunning. Fascinating. Inspiring. (Trying to impress you with my vocabulary other than 'cool' and 'neat'.) You and your friends have had a journey and experience of a lifetime! Beautiful David, so many beautiful birds are in nature. That was a most amazing trip; I am in awe and a little afraid to comment lest I use an inadequate adjective (but I am fearless and will go on). Wonderful to meet Stewart and his family and to have his expertise as a guide as well as his friendship. 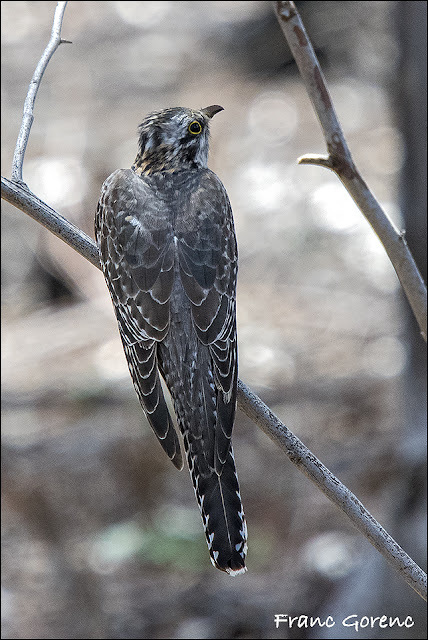 The birds are amazing; I plan to come back to this post and *only* look at the pictures. This time I concentrated on your narrative. In addition to the fabulous birds and friendship, I was struck by the good job whoever planned your trip did in finding the perfect lodging locations for avid birders. Carol deserves credit for planning the logistics of the trip. Meeting Stewart and his family was of course the highlight of the whole Australian adventure. Great photos, thanks for sharing these excellent report. What a simply amazing post David. I loved all of the photographs and the detailed report was just brilliant. i came back today, to finish reading!! i think you were very lucky to have a knowledgable guide, that can be invaluable. some birds, small birds do get beautiful homes. i have some luxurious bird houses in my yard. i have always wondered why larger birds don't find a protected area or cove in which to nest...someplace more protected. it is better for the photographer that they build right out in the open!! nice that they had good food. it is wonderful to eat well!! Thanks for coming back to finish it. So many amazing birds! 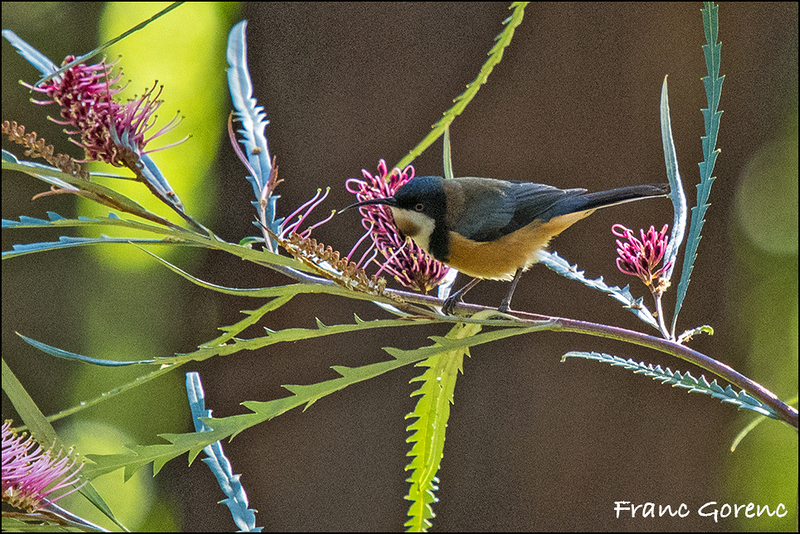 I love the photo of the Eastern Spinebill. But they are all wonderful to see and so different from the birds in my woods. That old rental car made me smile. What an amazing array of beautiful photos and such a comprehensive commentary. 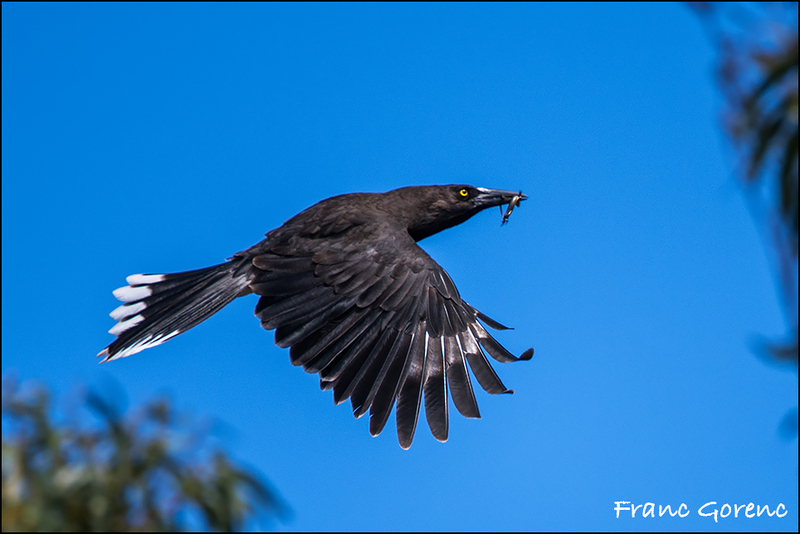 I enjoyed it all and now I will be looking more closely at the birds I take for granted in this state of Victoria, in which I live. Unbelievable, what a fantastic birds. 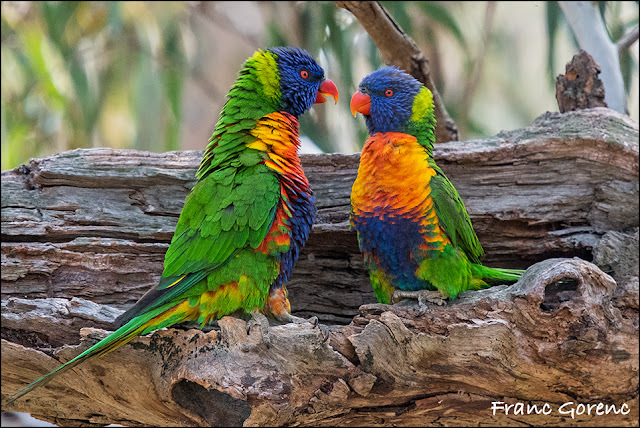 So colorful, such beautiful feathers. I have breathless looked at the beautiful pictures. The quality is great! And last but not least a great trip report! Almost a diary! I am happy that you enjoyed it, Maria. Hi David, wat een prachtig verhaal en gelardeerd met prachtige foto's. De ene nog mooier dan de andere en voor mij natuurlijk allemaal bijzonder. Het is aan je verslag echt te lezen dat jullie het heel erg naar je zin hebben gehad en fantastische nieuwe vrienden hebben gemaakt (met een excellente bibliotheek... ). Leuk om zo je contacten wereldwijd te onderhouden en zoveel met elkaar te genieten en van elkaar te leren. Het was een bijzondere reis met bijzondere vogels en andere dieren. Ik ga niet zeggen welke ik het mooist vind want ze zijn allemaal mooi en ieder dier heeft zijn eigen charme! It was indeed an amazing journey, Marianne, and as you say all the birds are beautiful. There is no need to pick favourites.